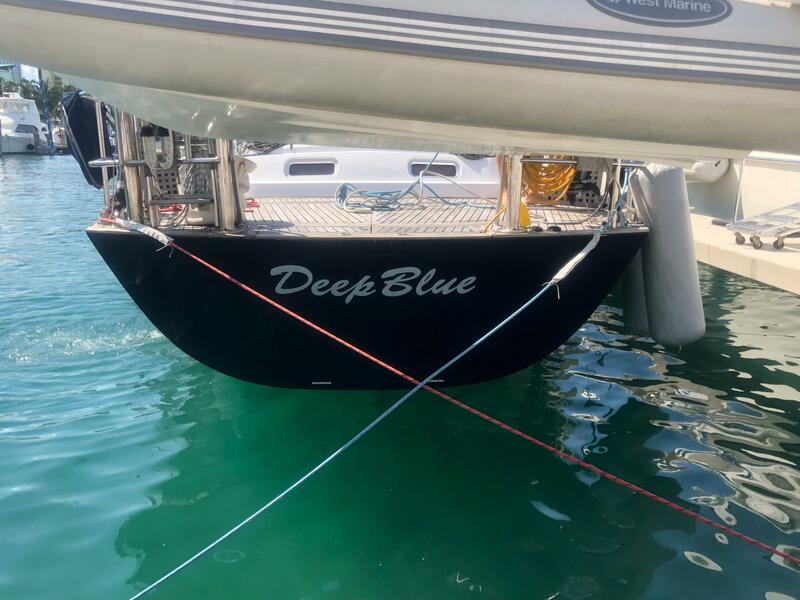 Deep Blue is going through a facelift. 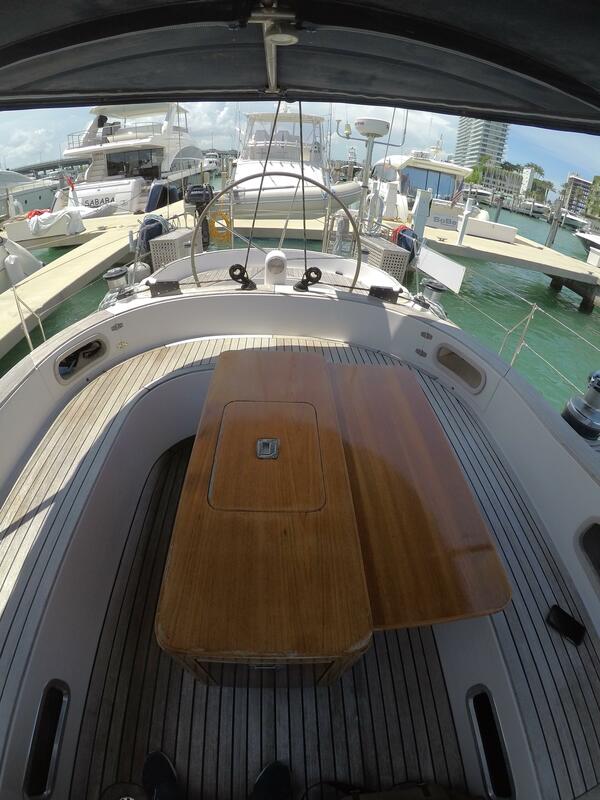 Check out the lastest photos on the wood finishes and mirror-like finish of the gelcoat. 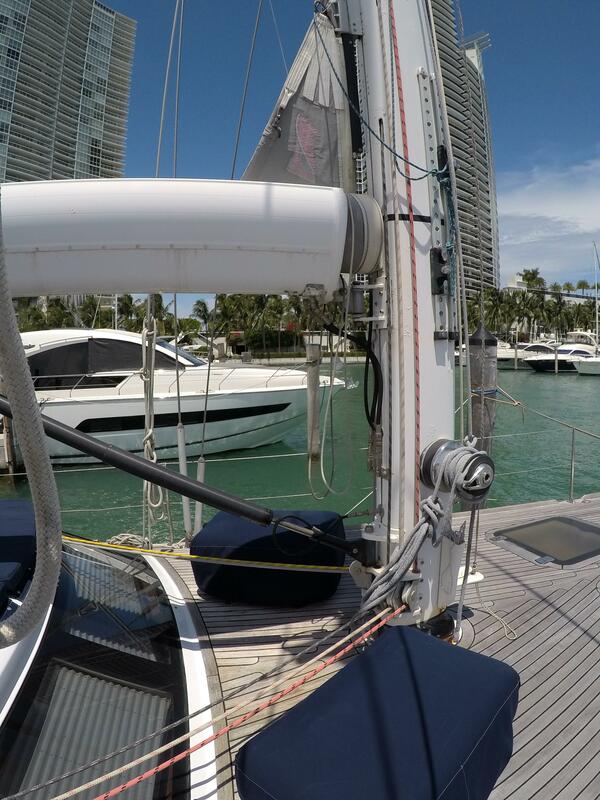 You don't see many North Wind sailing yachts on this side of the Atlantic. 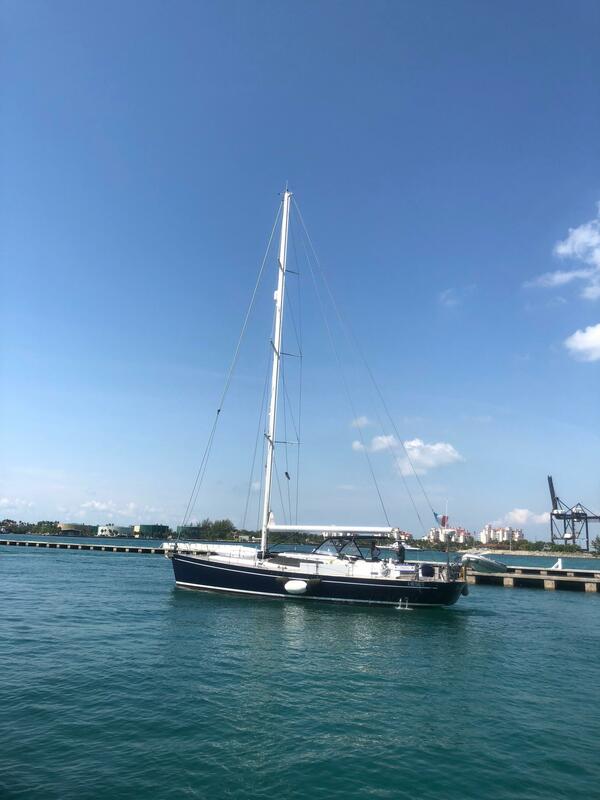 She's a Sparkman & Stephens design made in Spain. 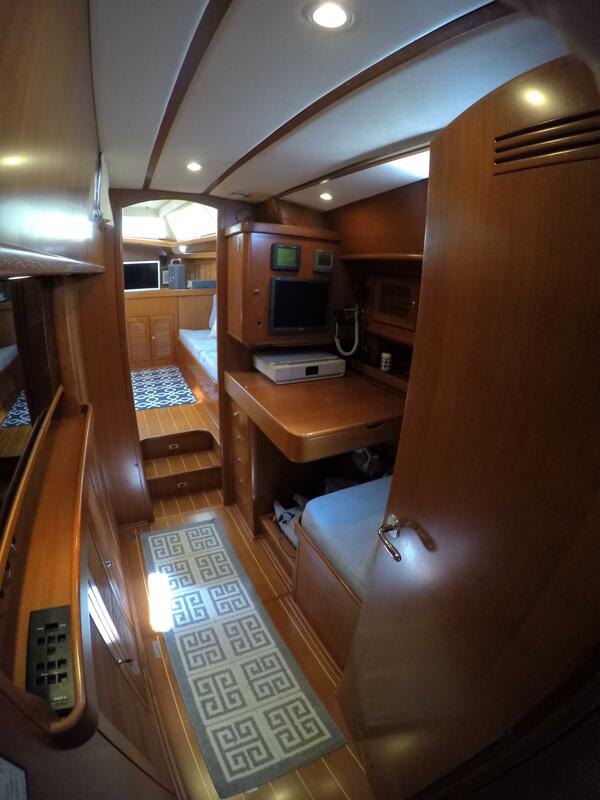 I would put it side-by-side with a Beneteau or Jeanneau. 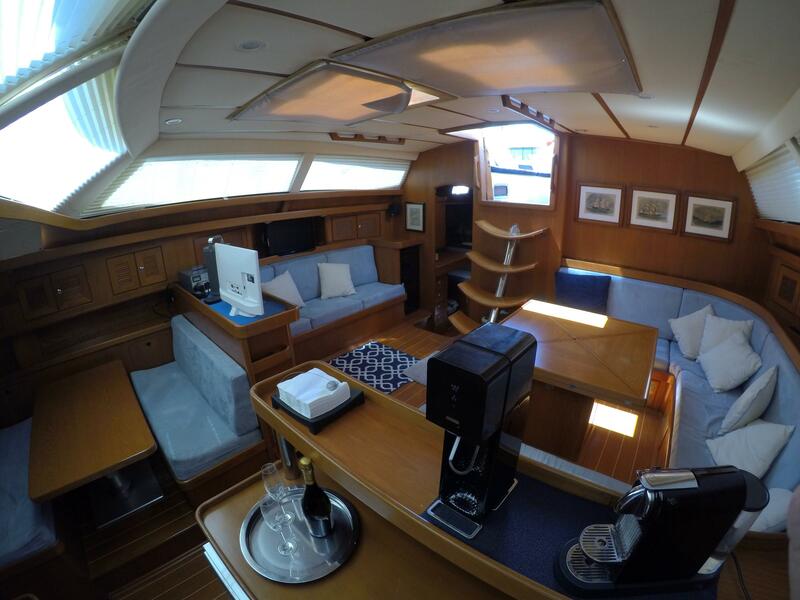 What makes her most interesting is the double center cockpit, offering a spacious area for dining with eight guests alfresco, or while sailing. 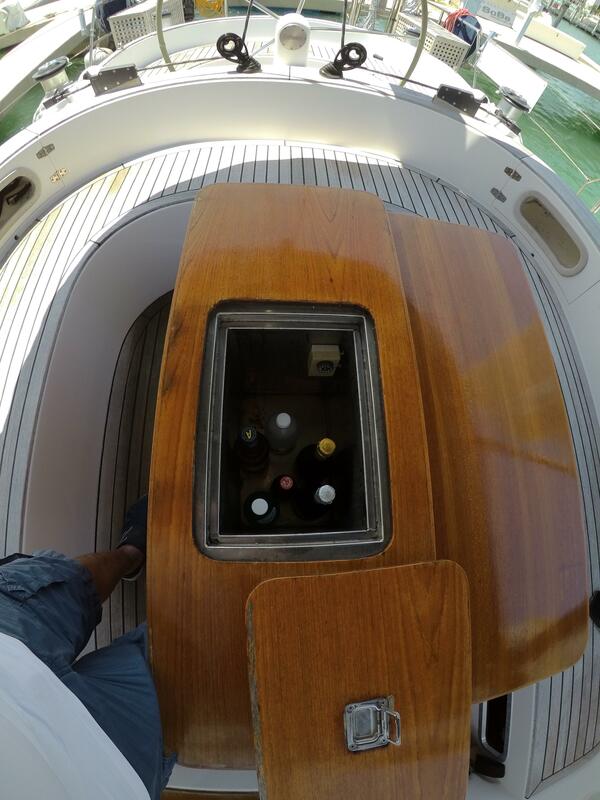 Then a small cockpit just aft for the helmsman and two more guests. 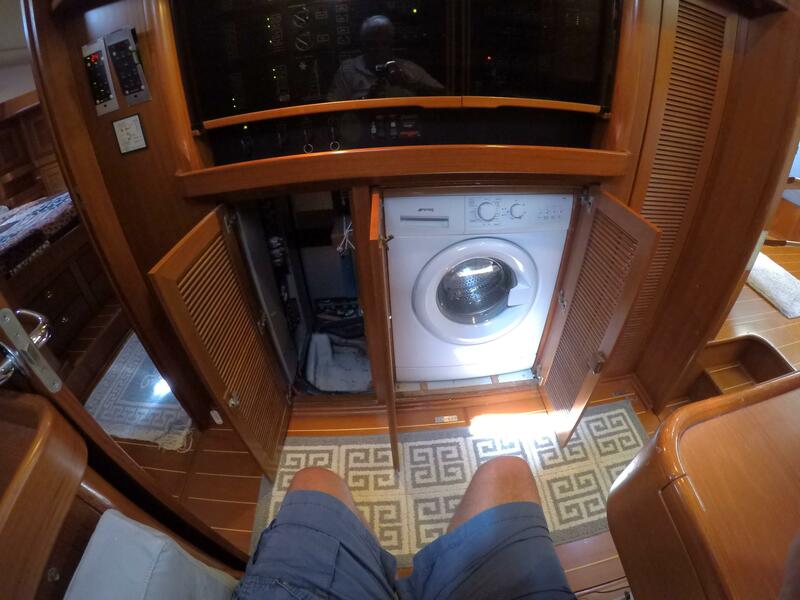 One benefit is your privacy while your hired captain is at the helm. 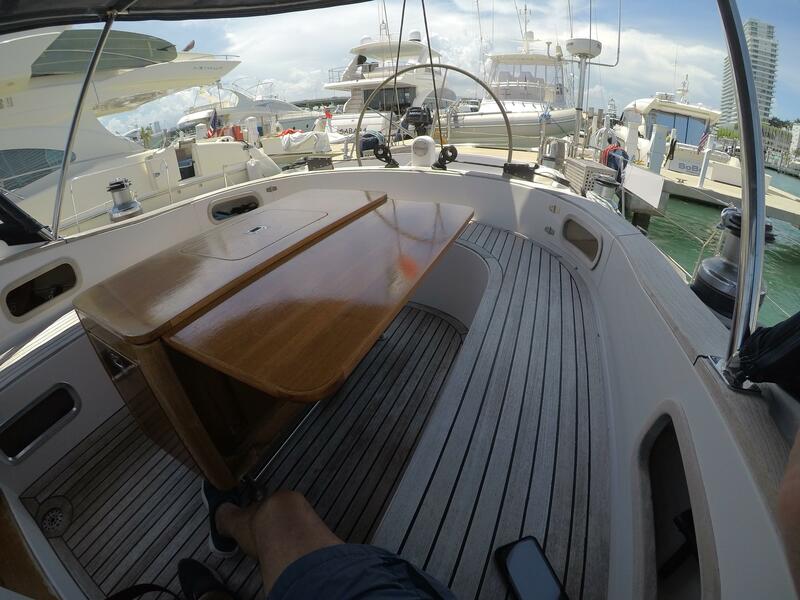 A second benefit is just keeping the eating area clear of the helm. 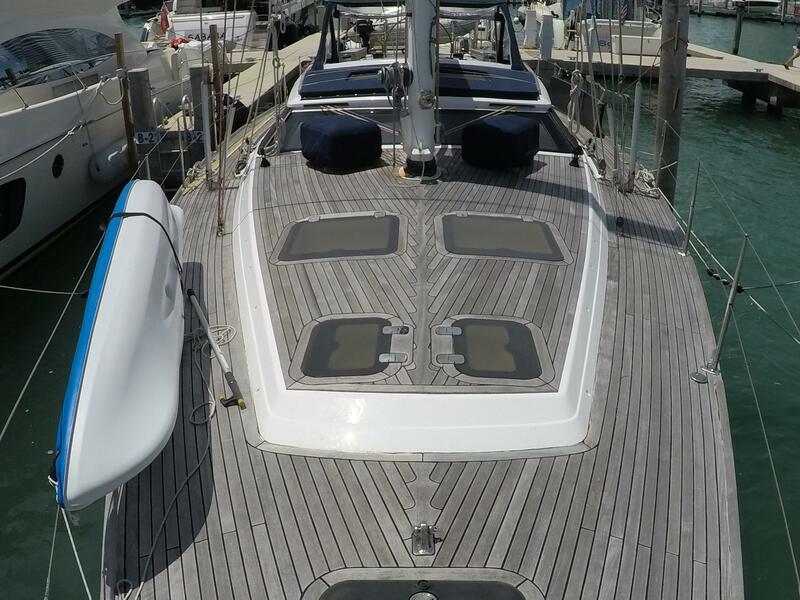 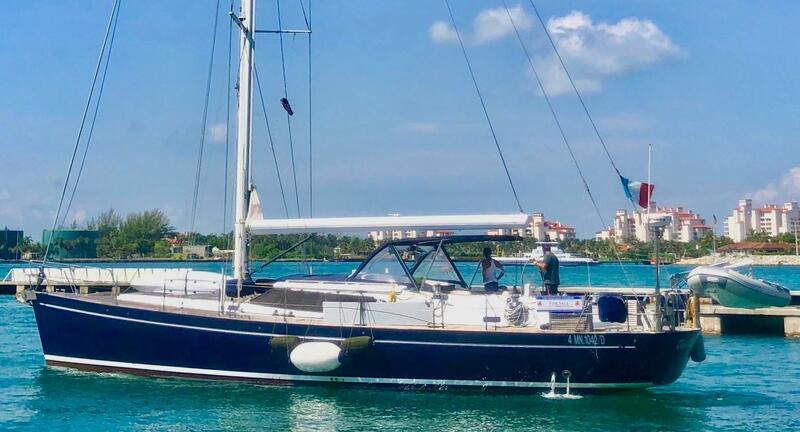 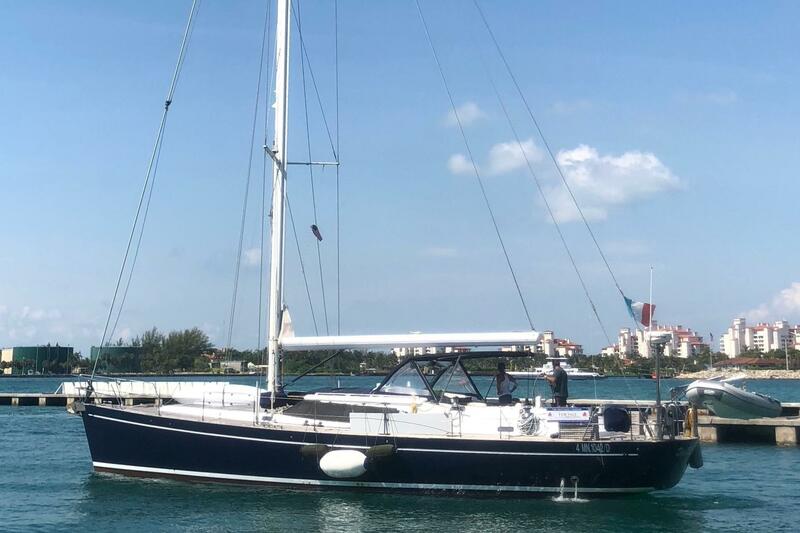 DEEP BLUE literally has a deep blue hull, contrasting with the white fiberglass coachroof and mast and boom. 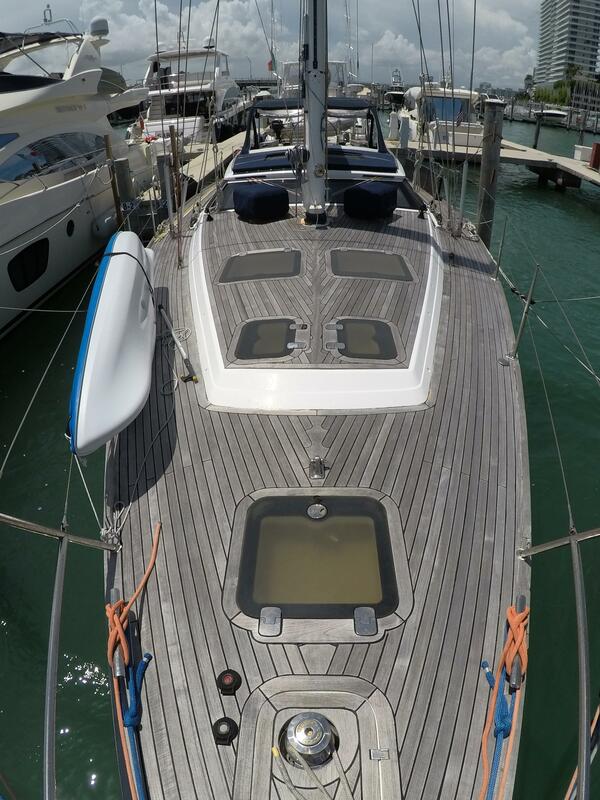 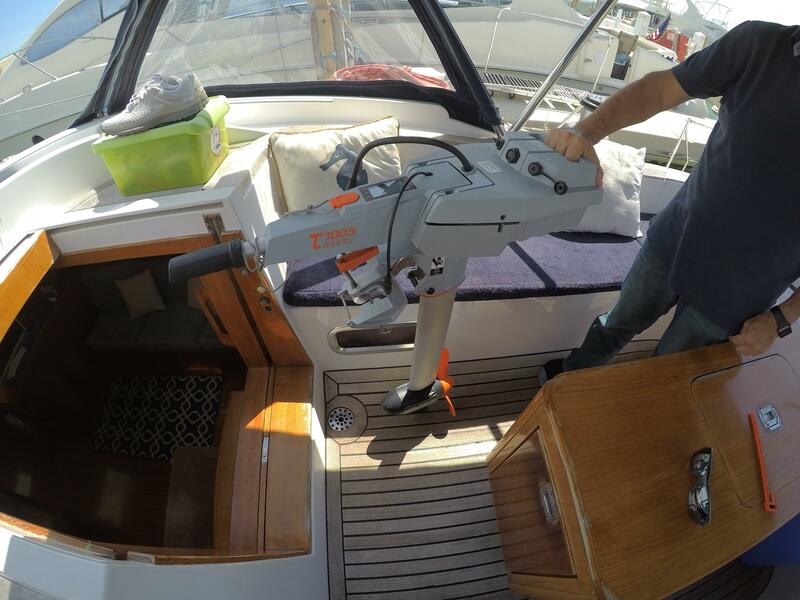 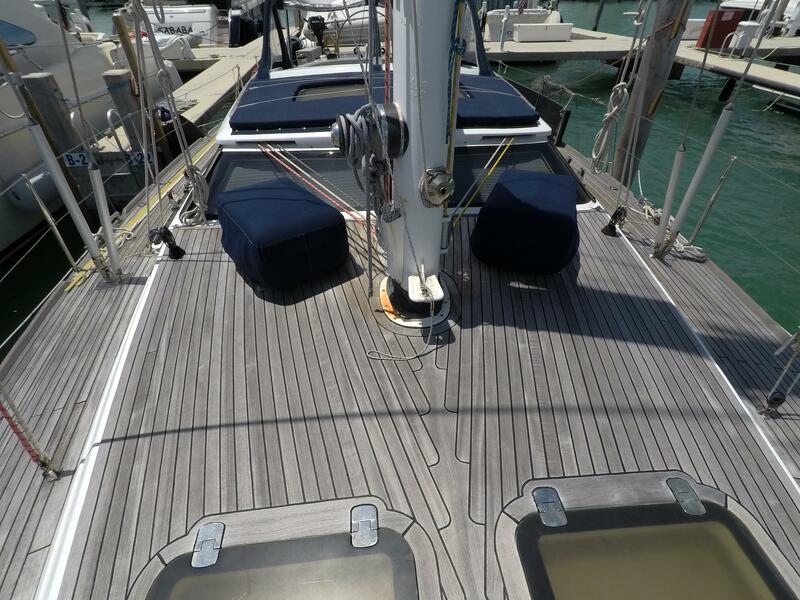 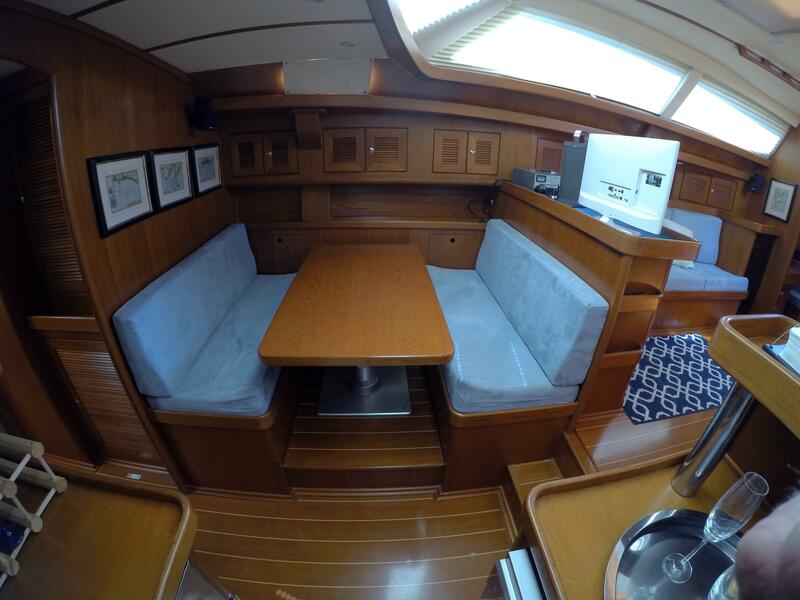 The teak decks and cockpit are in very good condition with varying thicknesses according to location. 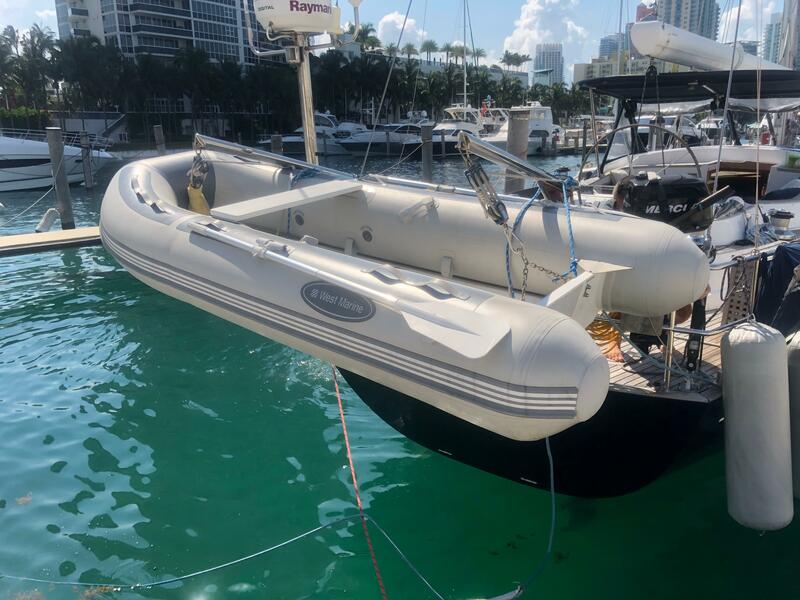 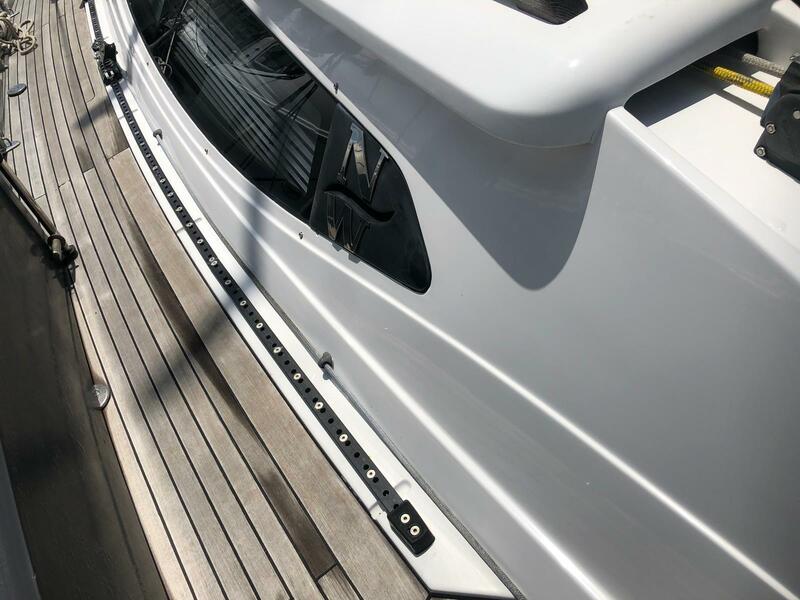 Hydraulic swim platform, swim ladder, passarrell, SS dinghy davits, 9 ft WestMarine hardbottom dinghy, 6 hp Mercury o/b on outboard engine bracket. 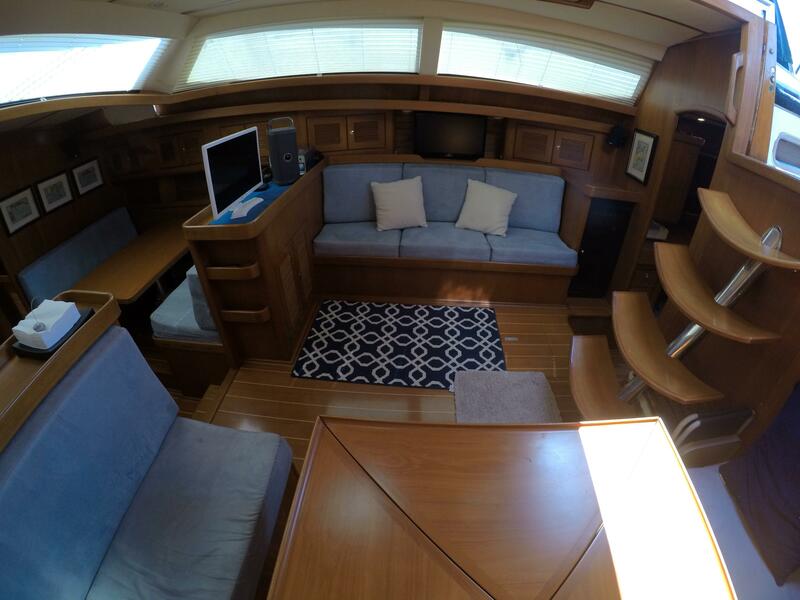 Above deck at the stern are two teak lattice deck boxes. 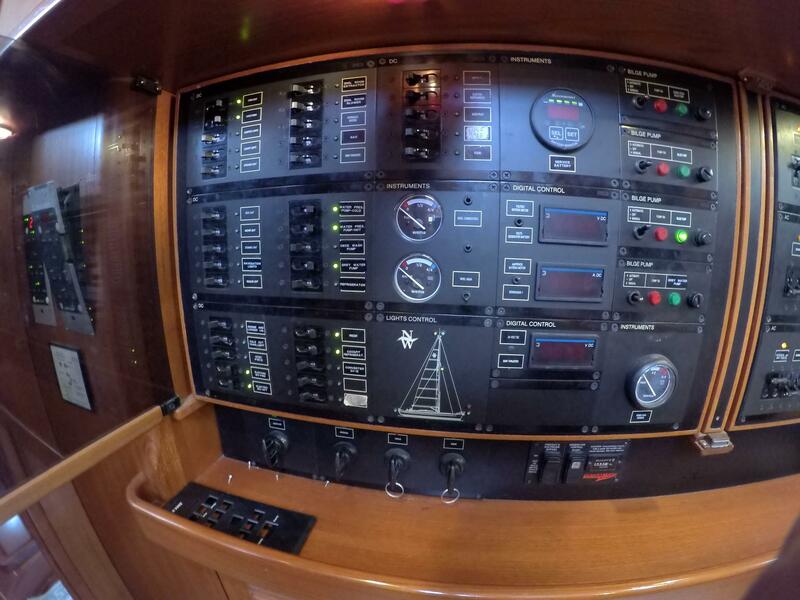 One in each corner of the stern. 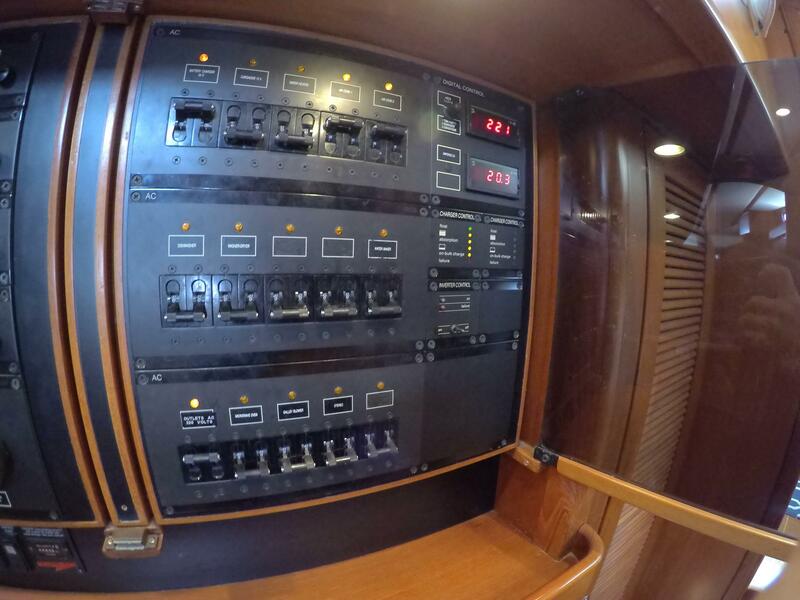 In each corner you will also see the hydraulic actuators at the base of the two backstays. 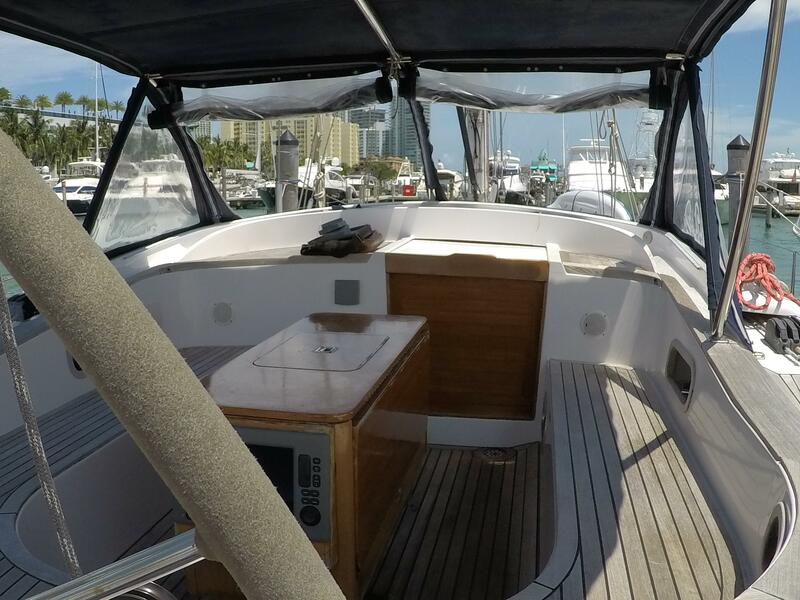 Moving forward you find the helmsman's cockpit, with seating for three adults. 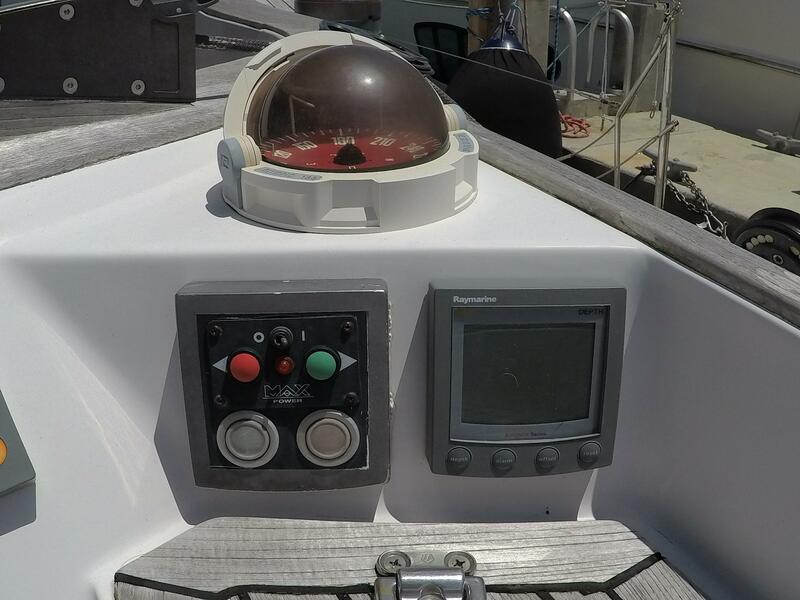 A fully instrumented helm with a compass, raydata and anemometer on each side of the helm. 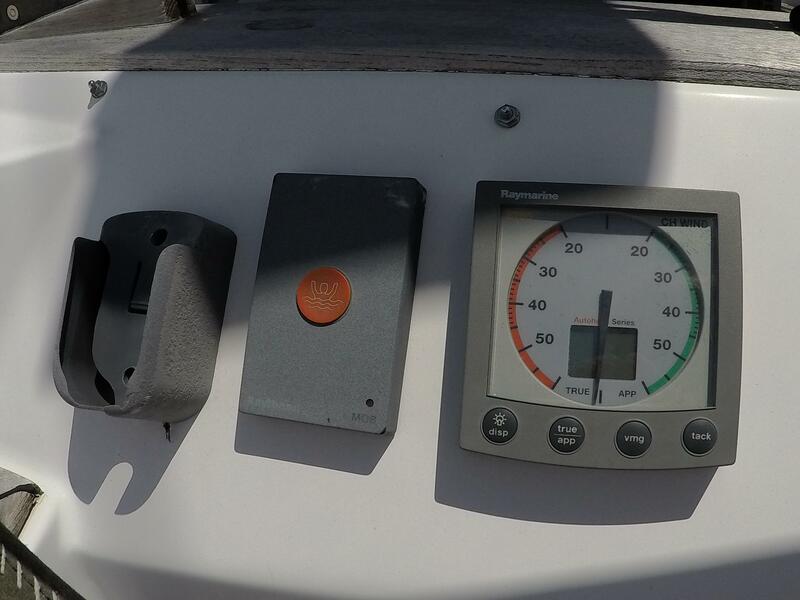 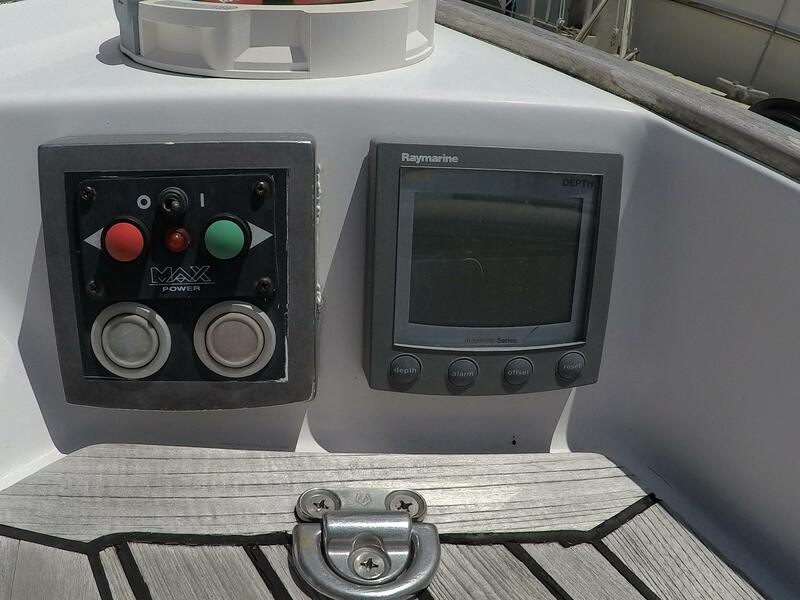 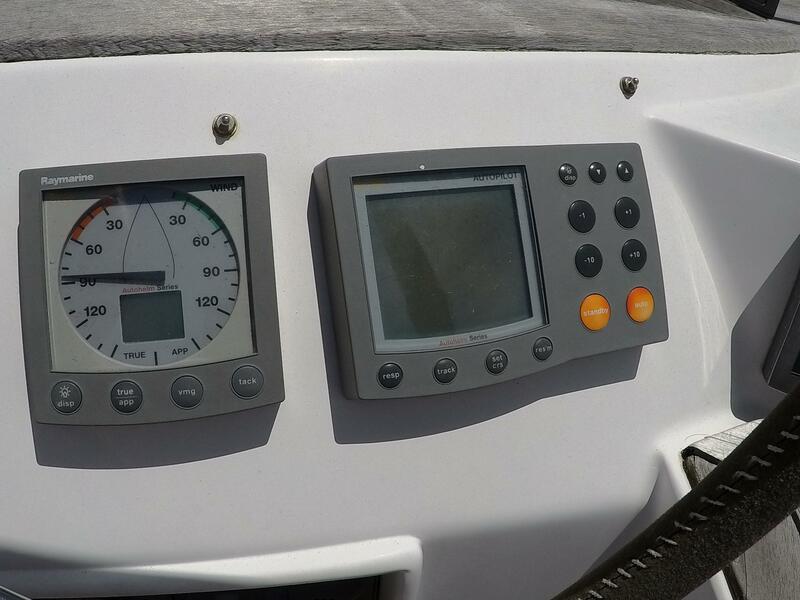 Autopilot, bow thruster, windlass control, and hydraulic controls for the in-boom mainsail furler and the Genoa furler. 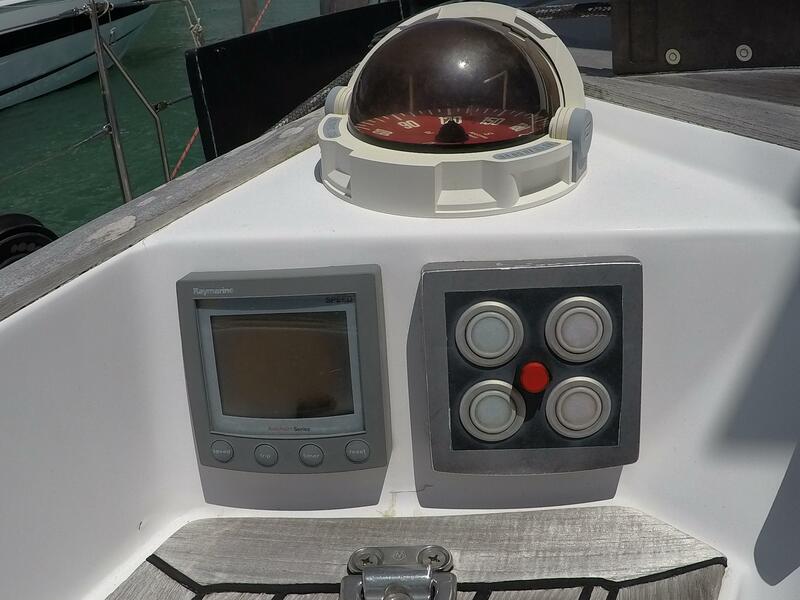 Forward of the helmsman cockpit is the large guest cockpit with seating for 8. 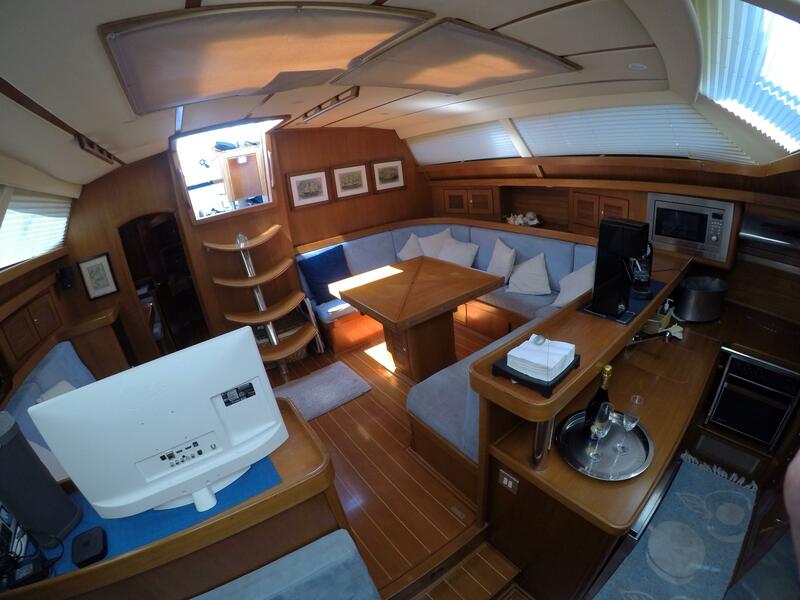 At center is a large cockpit table with two folding leaves, and a deep recessed electric refrigerator in the middle of the table. 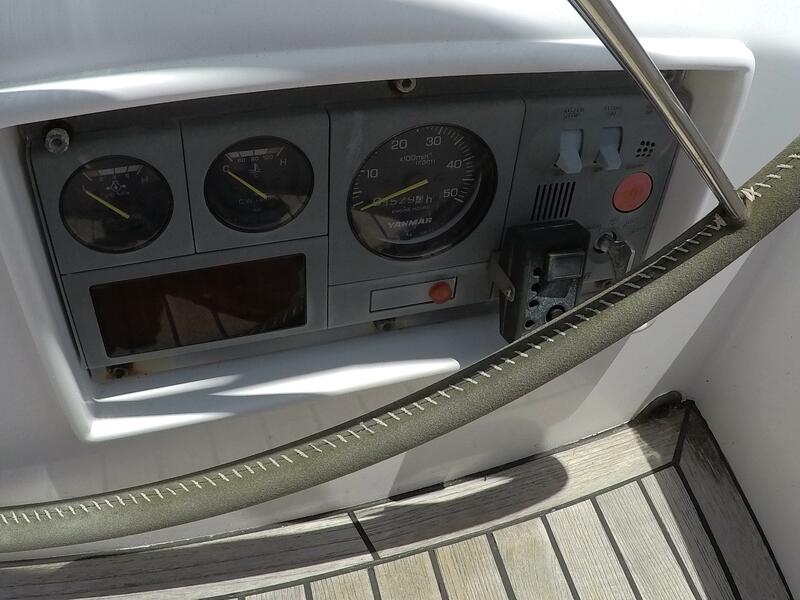 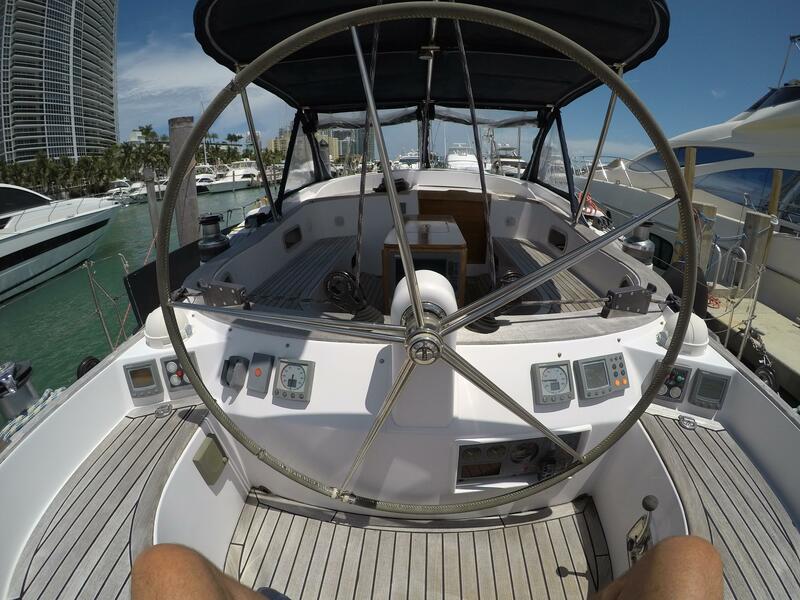 The cockpit has a full-length bimini and dodger. 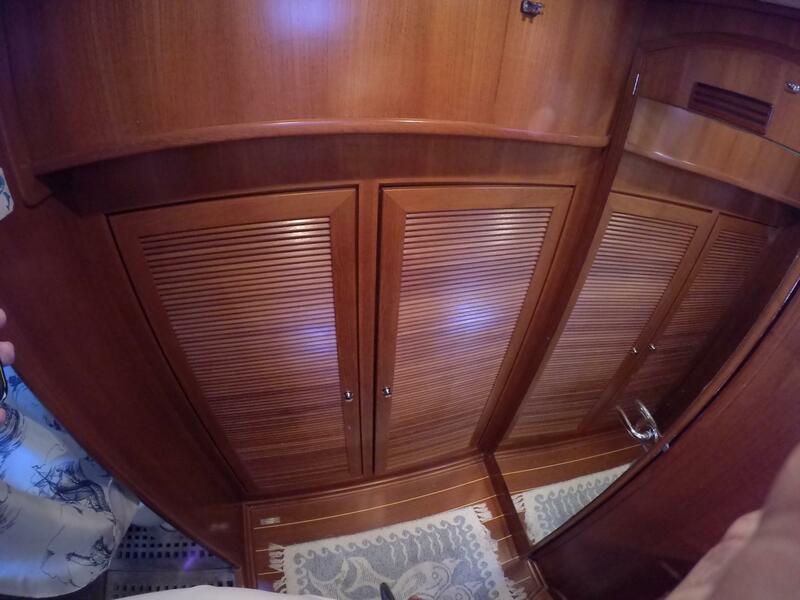 Entrance to the Saloon has a sliding door that goes down, disappearing under the door transom. 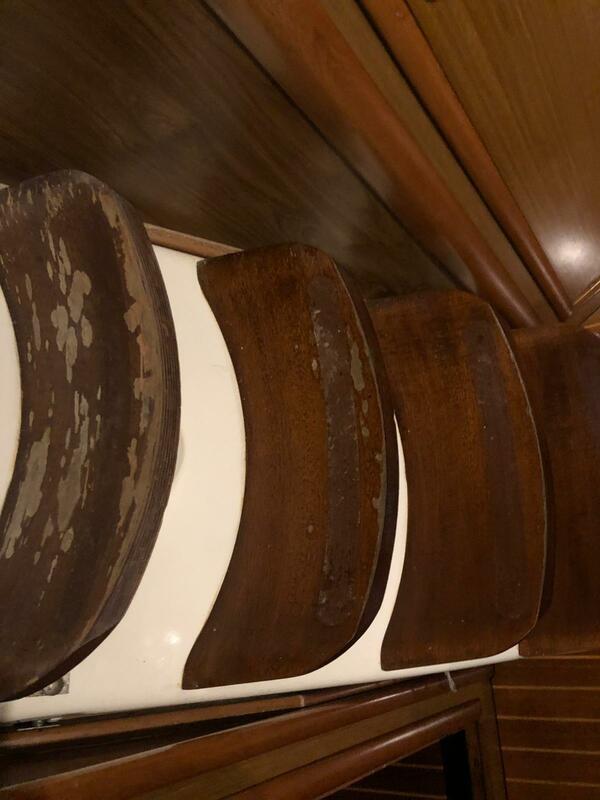 Moving forward along one of the side decks, you will notice the double side stays. 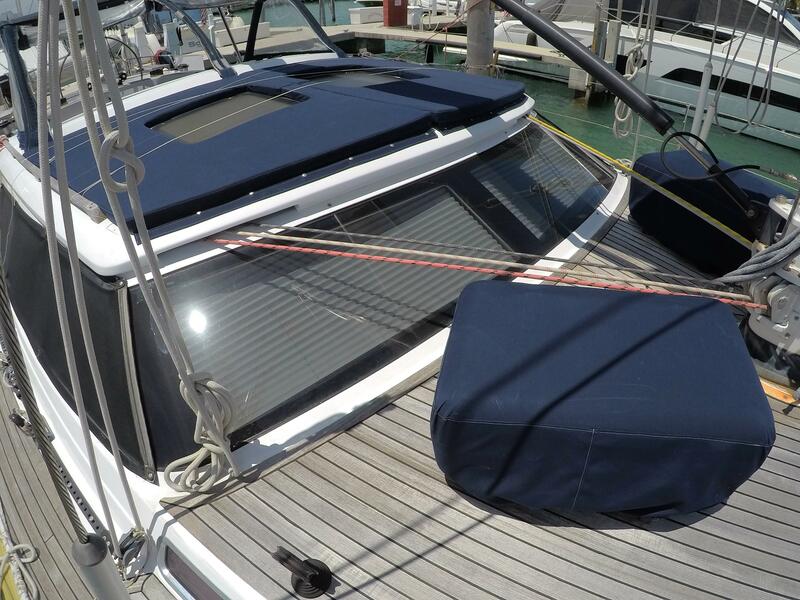 Forward of the dodger is the coachroof with two hatches and full size cushions for sunbathing on the coachroof. 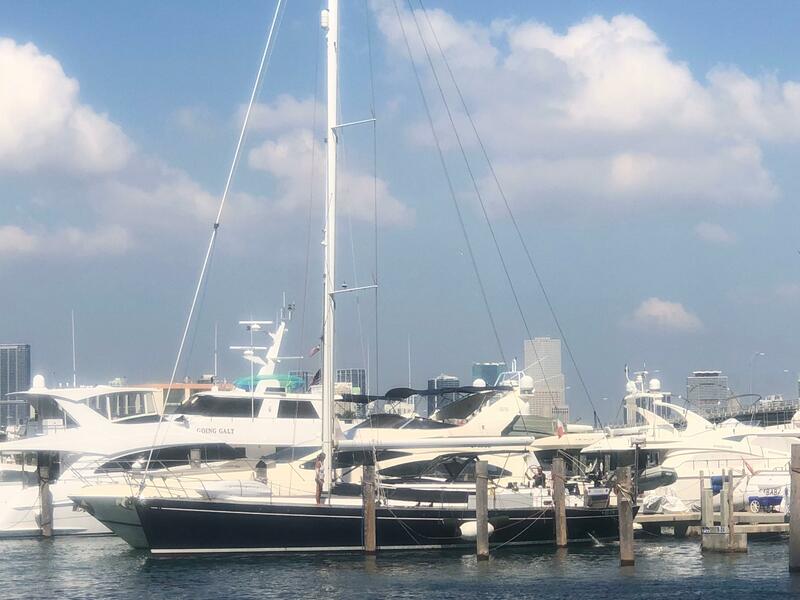 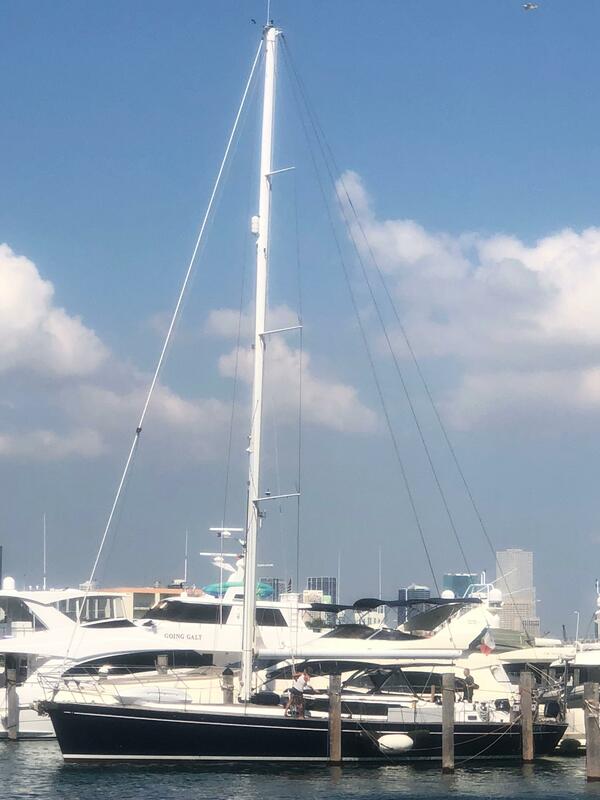 At the base of the mast you will observe the hydraulically operated boom vang, and Leisure furl boom. 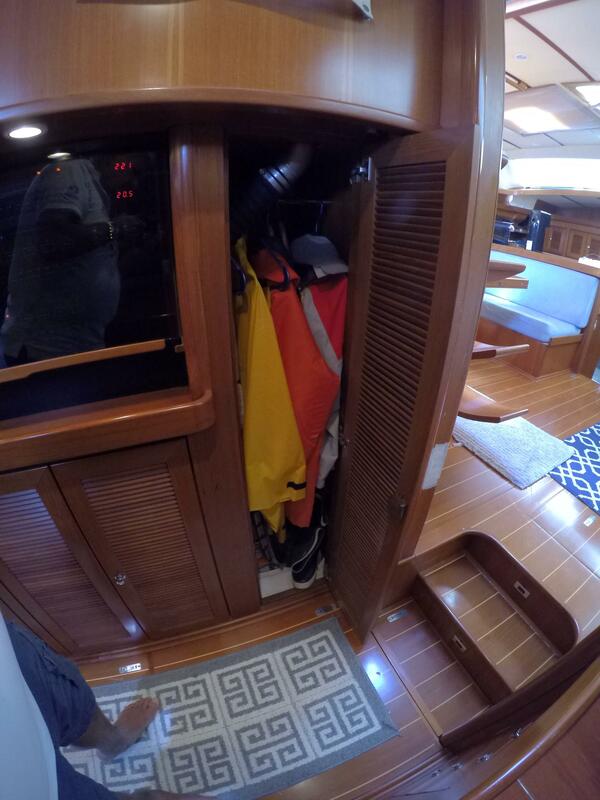 The rigging includes a spinnaker pole that is currently in storage. 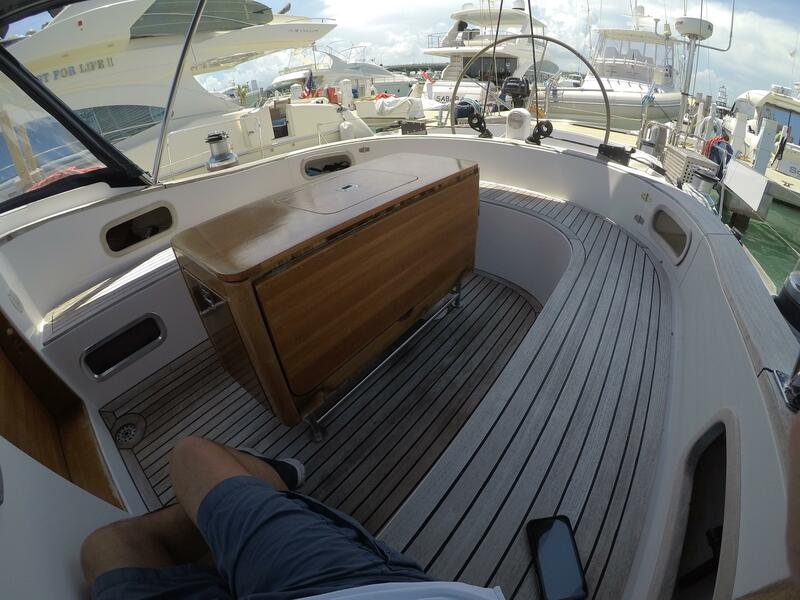 Beautiful and heavy flush hatches adorn the forward teak deck area. 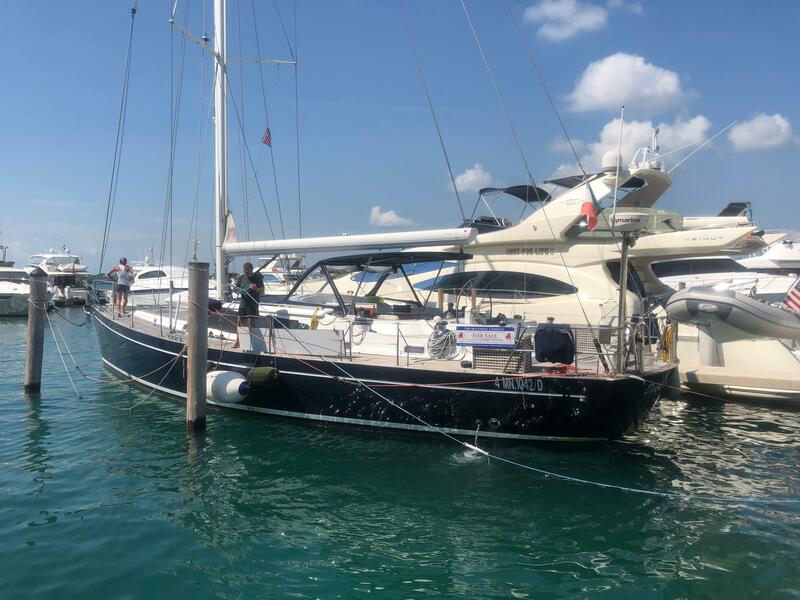 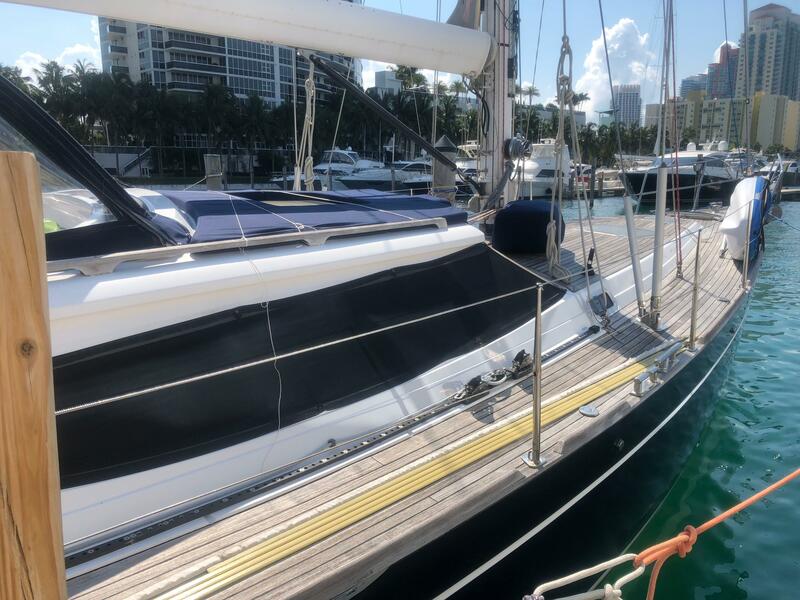 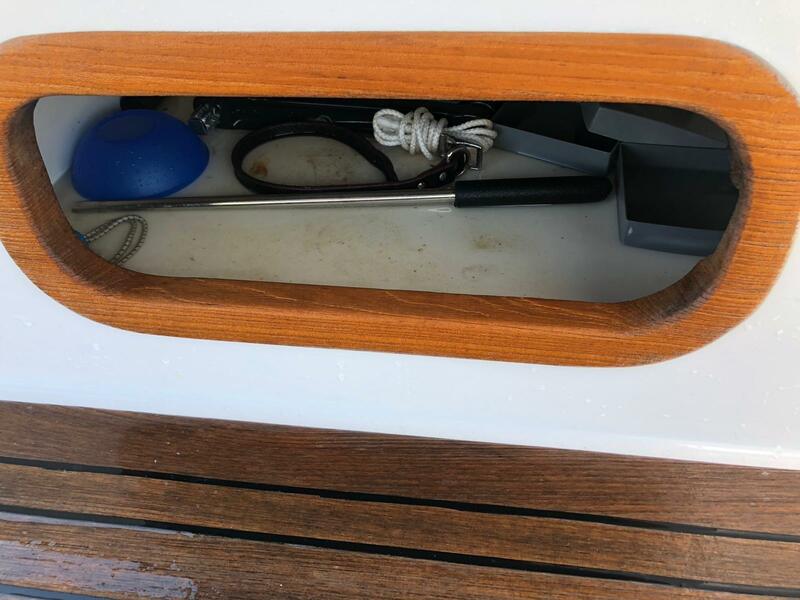 Staysail gear and halyard, electric windlass, and finally at the bow the hydraulically operated Genoa furler and anchor. 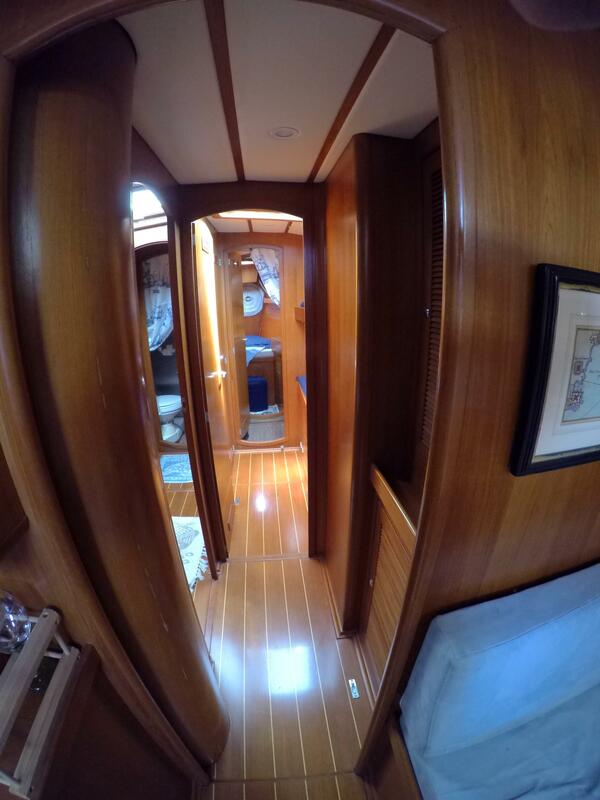 Coming down the companionway from the cockpit, one enters the Grand Saloon, which can be viewed as 4 quarters. 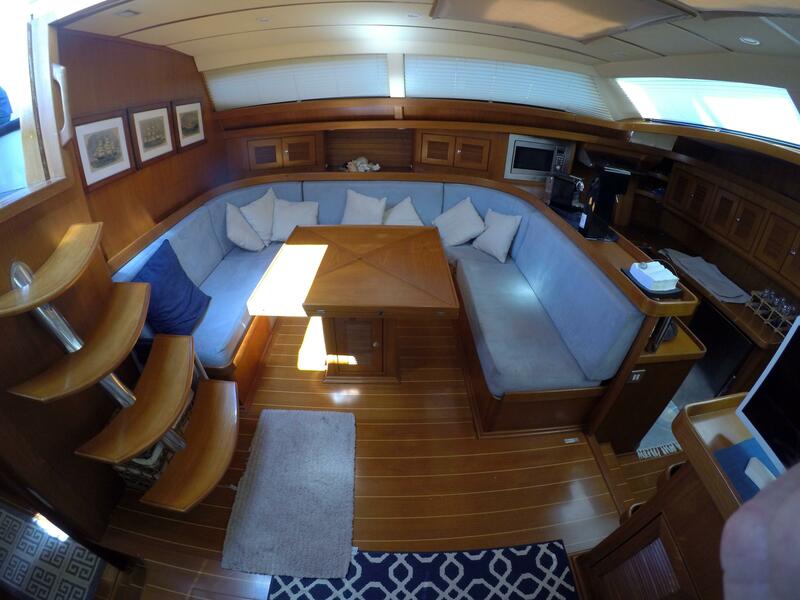 The port aft quarter has a U-shaped seating area for at least 6 adults. 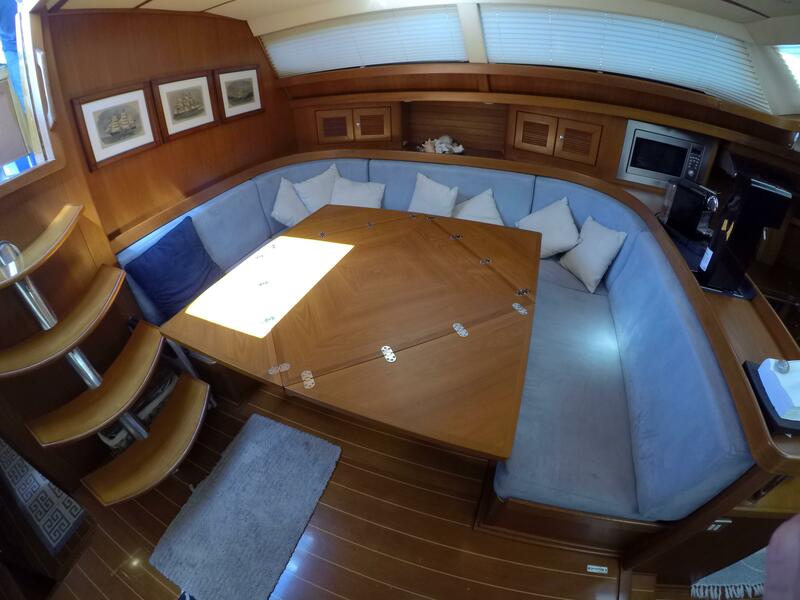 In the center of this U is an expandable cocktail table that unfolds to a full-size dining table. 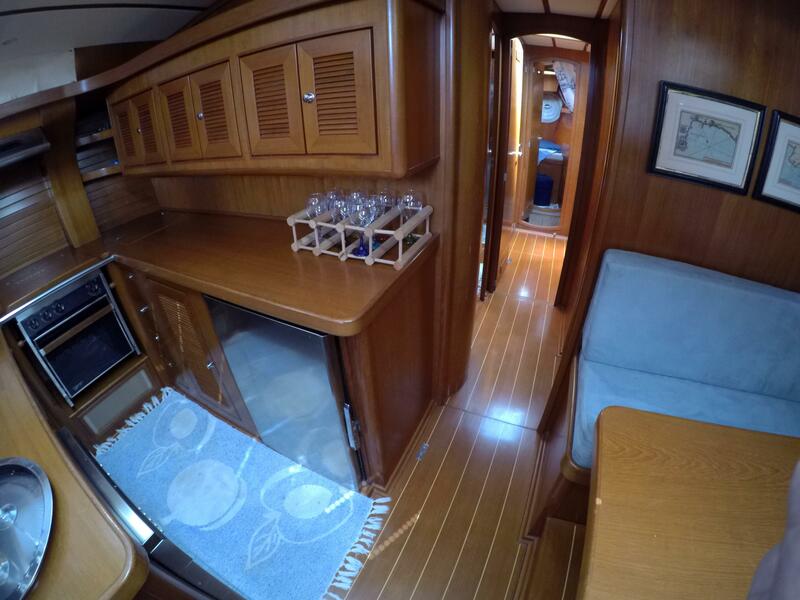 The starboard aft quarter has a settee for 3 adults, with a stereo cabinet on the aft end, and a half height counter dividing it from the Dinette. 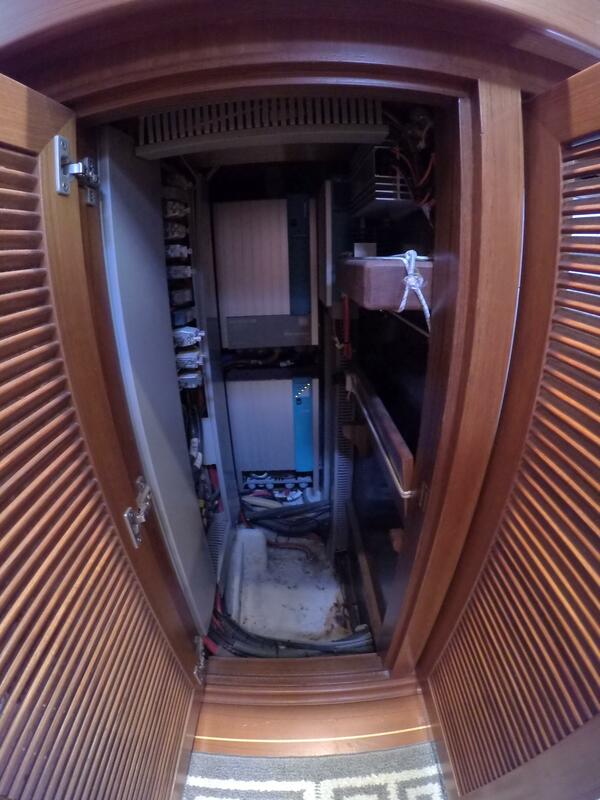 The port forward quarter contains the Galley. 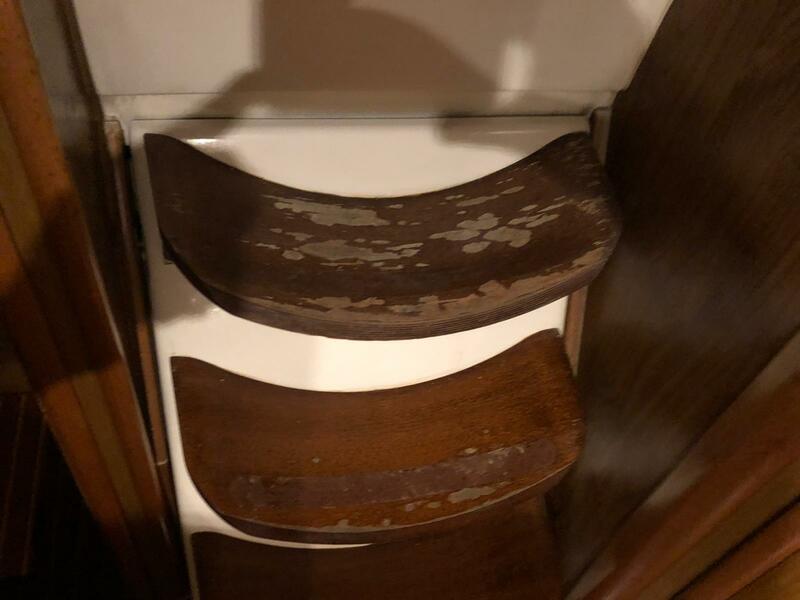 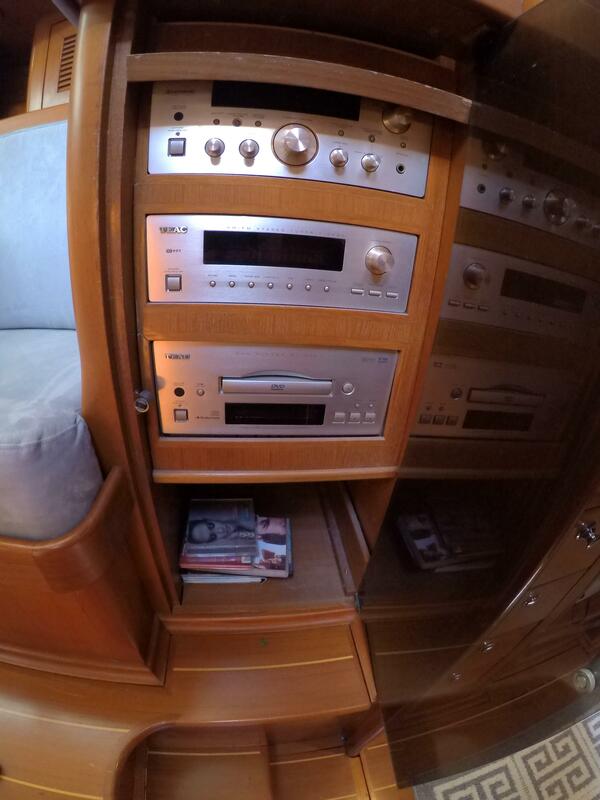 The starboard forward quarter contains the Dinette. 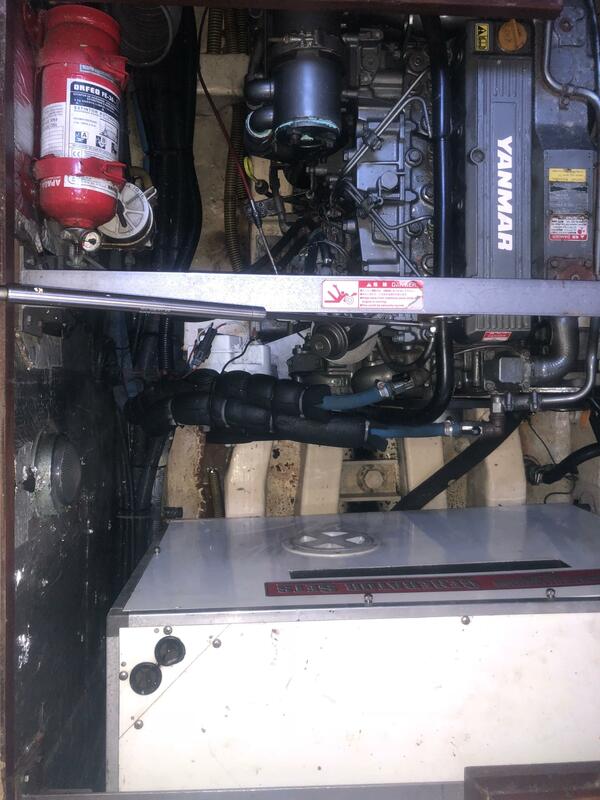 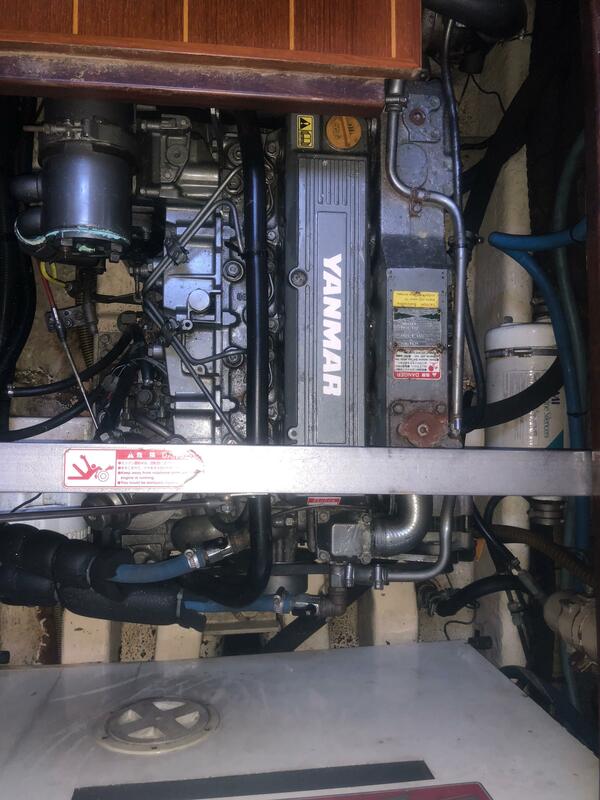 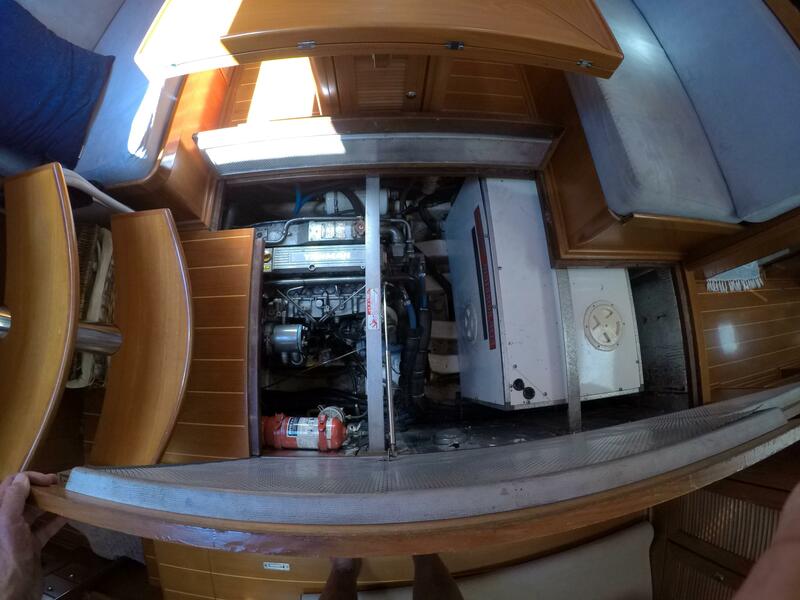 The Engine Room is under the sole in the middle of this saloon area, also containing the 8 kW generator in a soundproof case. 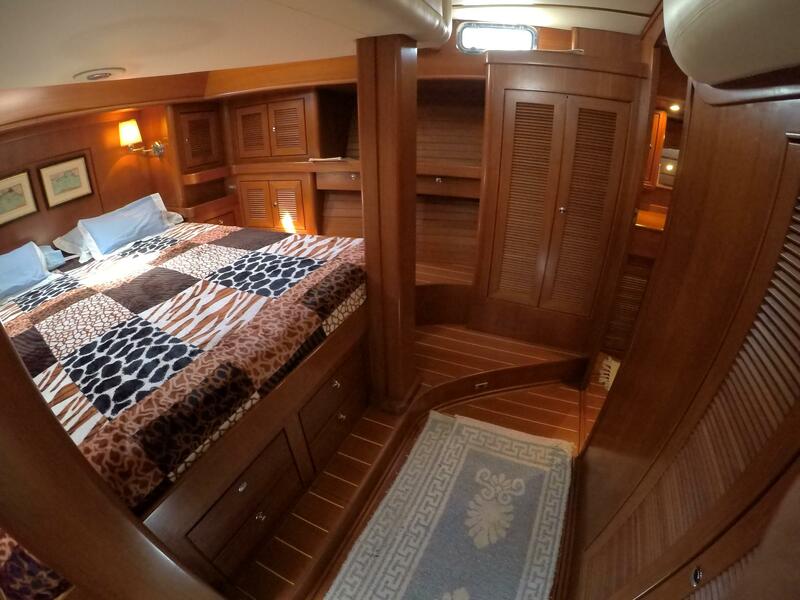 Forward of the Grand Saloon, there is a centerline companionway that leads to two guest cabins and the v-berth Captain's cabin. 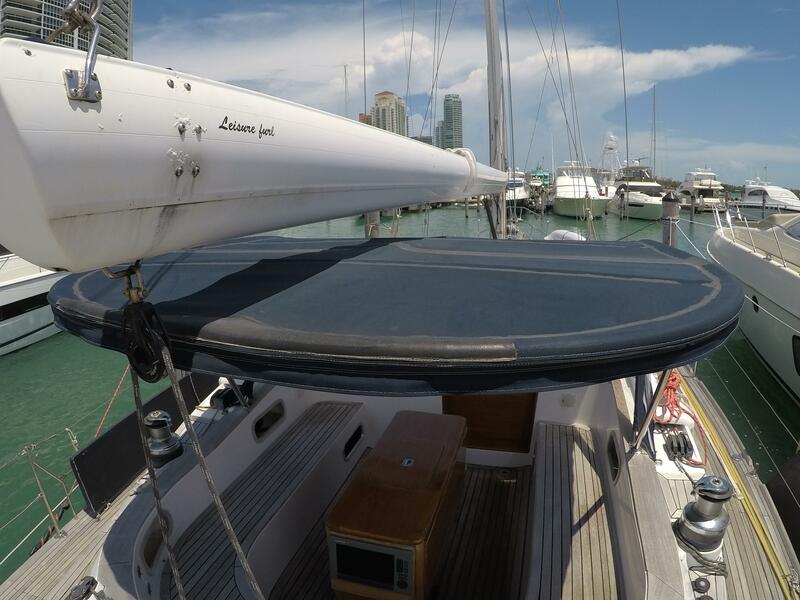 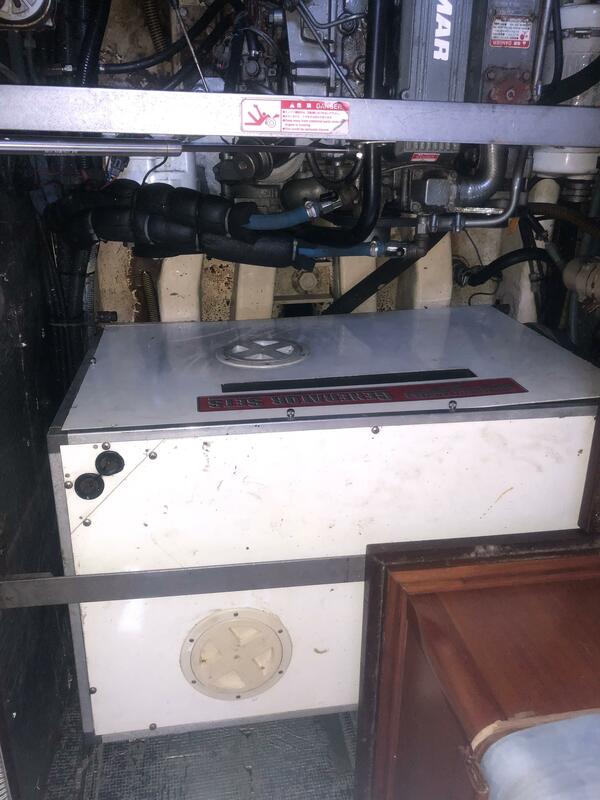 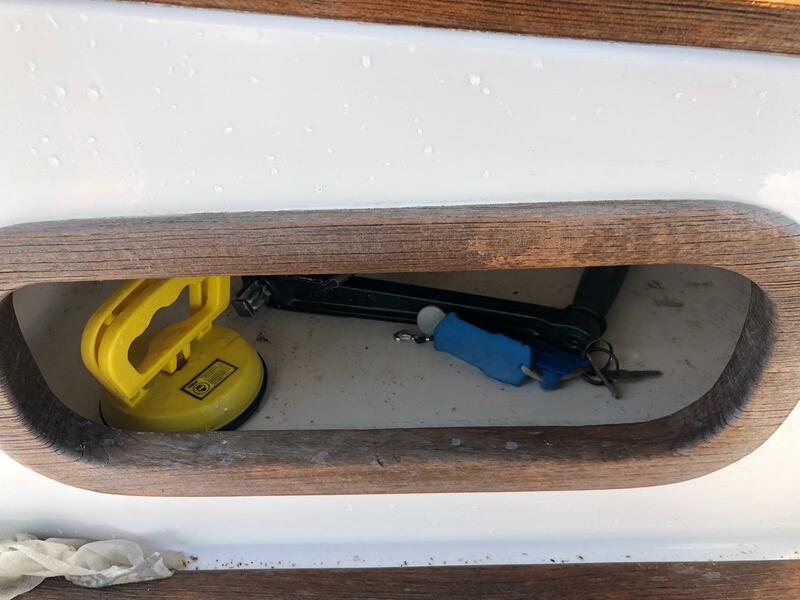 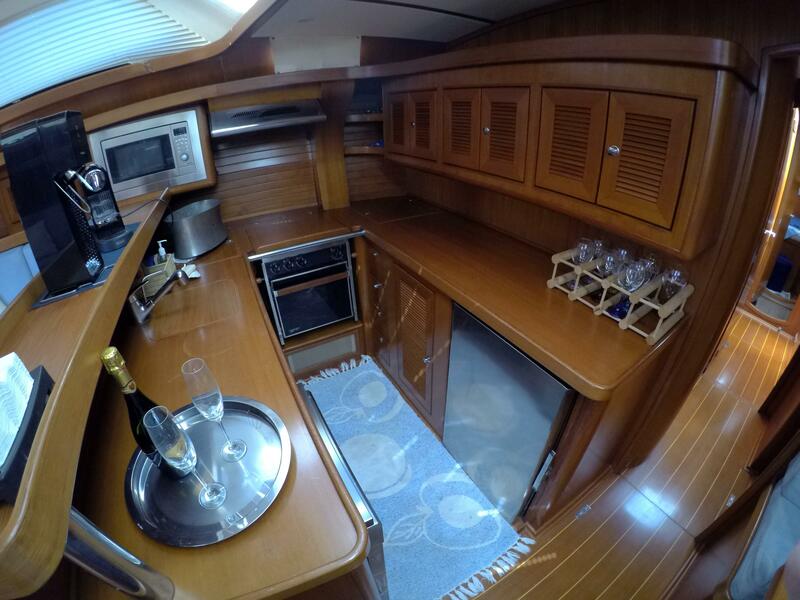 Aft of the Grand Saloon, an off-center to starboard companionway leads aft to the nav station on the outboard side, and the electrical panel, washer/dryer, and inverter inside the inboard cabinet. 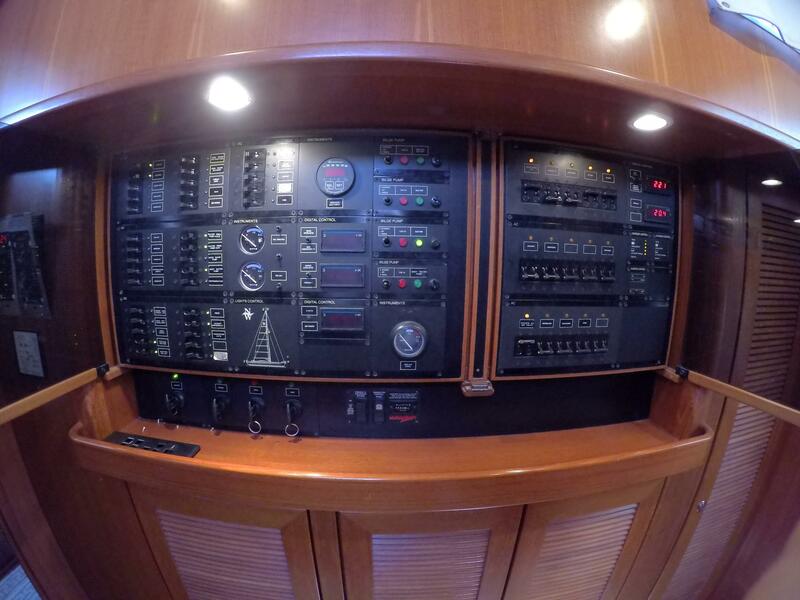 Aft of this nav station area is the entrance to the Master Owner's Cabin. 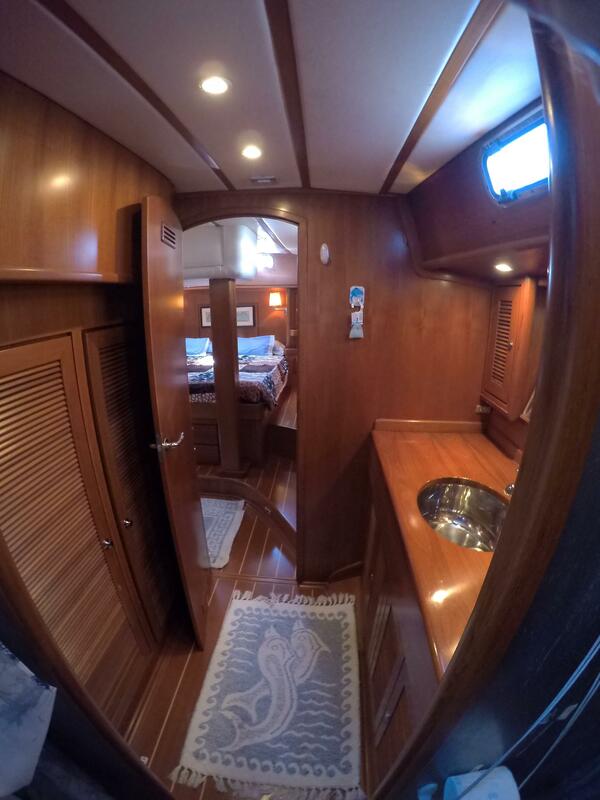 This cabin has full queen size berth in the centerline, surrounded by cherry cabinets and paneling. 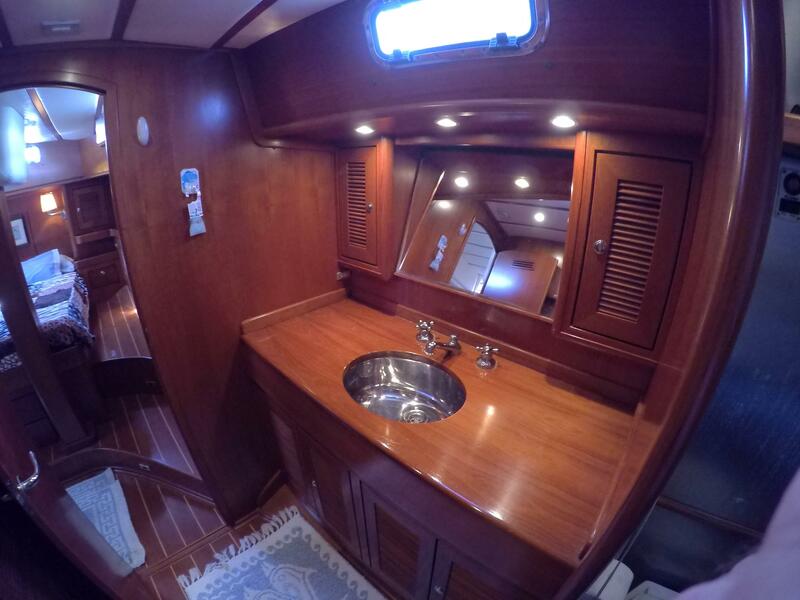 Walking to port and the forward is the sink on another beautiful cherry countertop, with mirrors and linen cabinets. 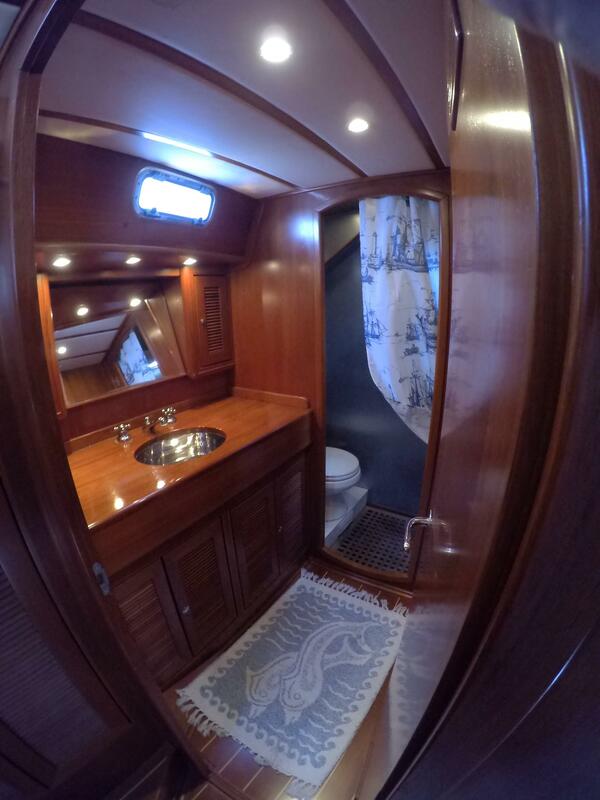 Forward you enter the combo SS lined shower, head and bidet enclosure. 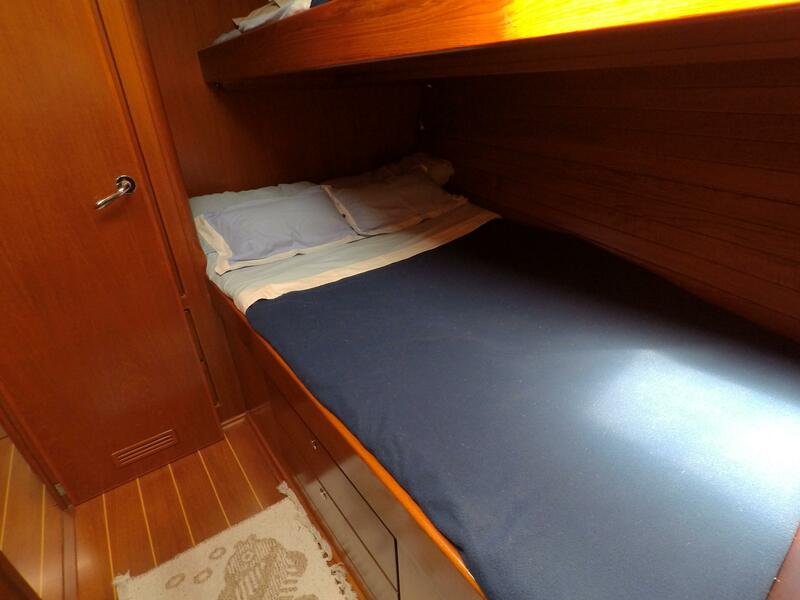 Galley is located amidship on the port side, in the forward quarter of the grand saloon. 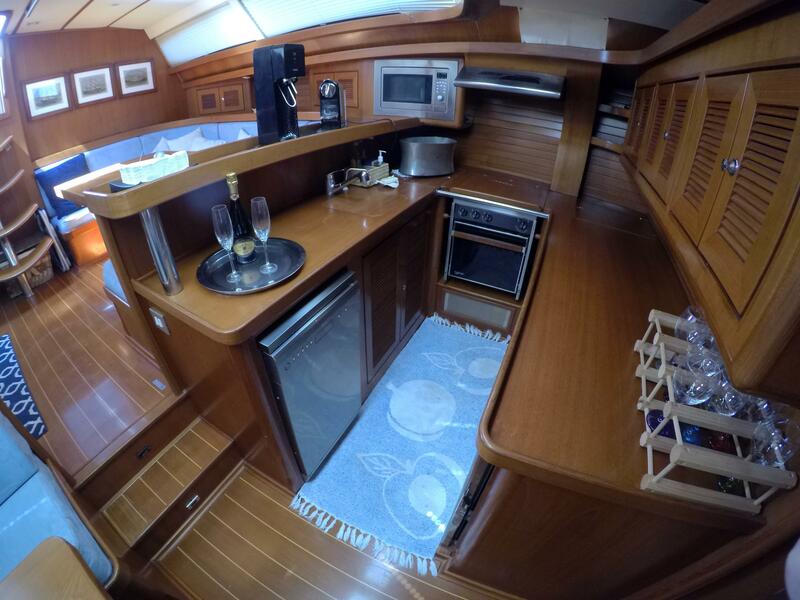 Galley is U-shaped, entirely finished with cherry cabins and countertops, and a raised bar. 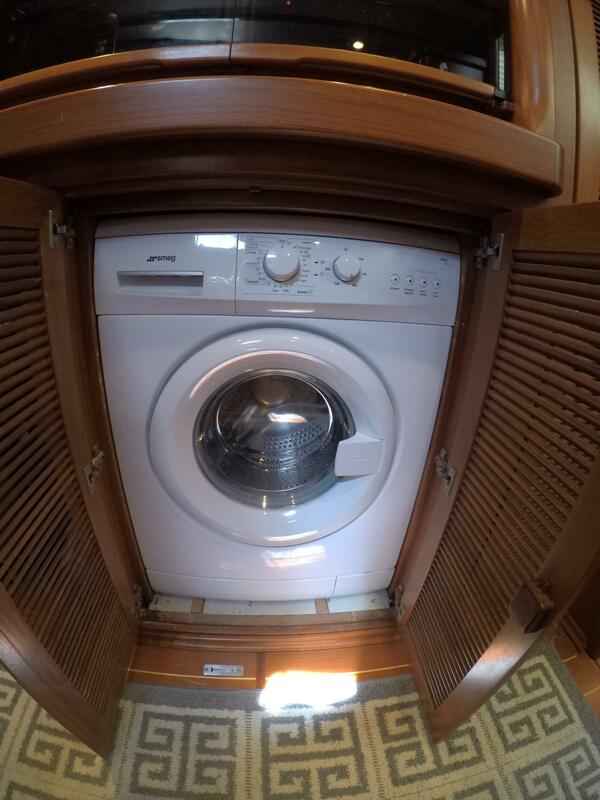 Dishwasher, double sink, top loading freezer, propane 3 burner stove and oven, top loading freezer, refrigerator. 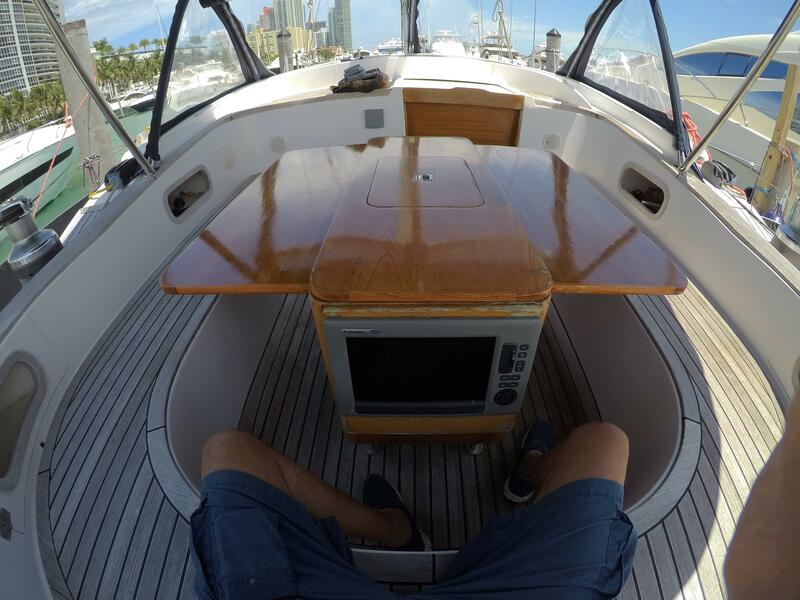 Microwave on top of bar. 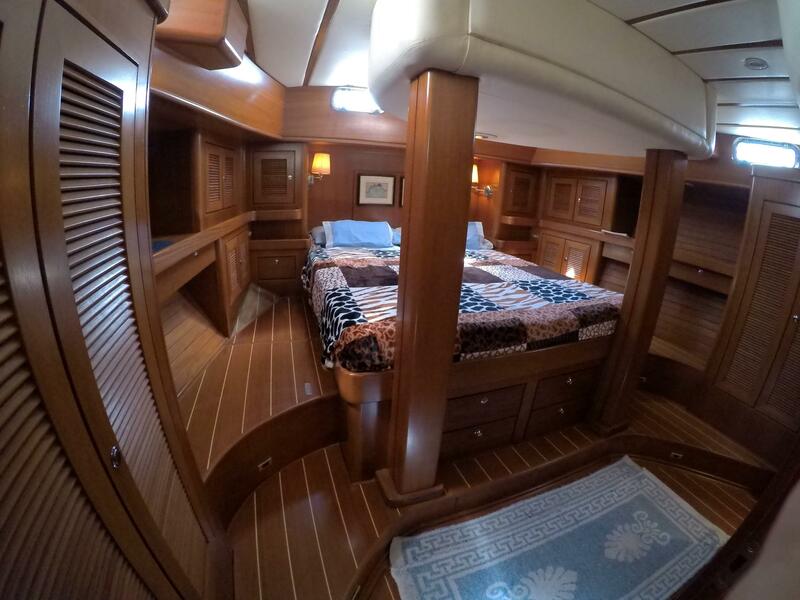 Dinette is located amidship on the starboard side, in the forward quarter of the grand saloon, just across from the Galley. 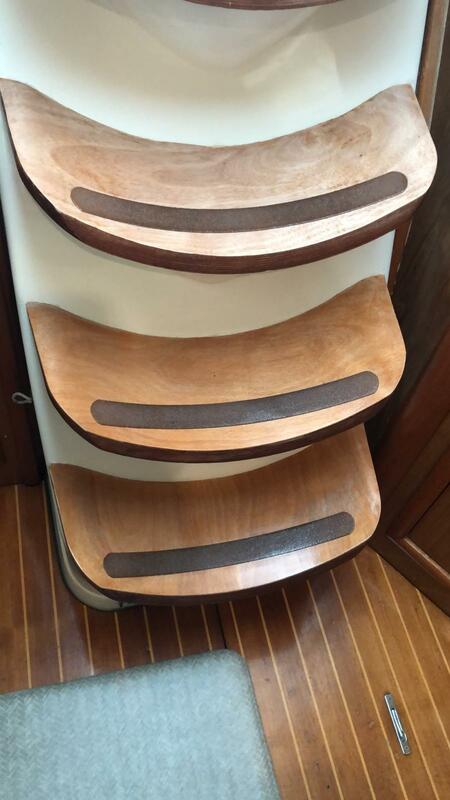 Seating for 4 and the table drops to make a bed for 2 children. 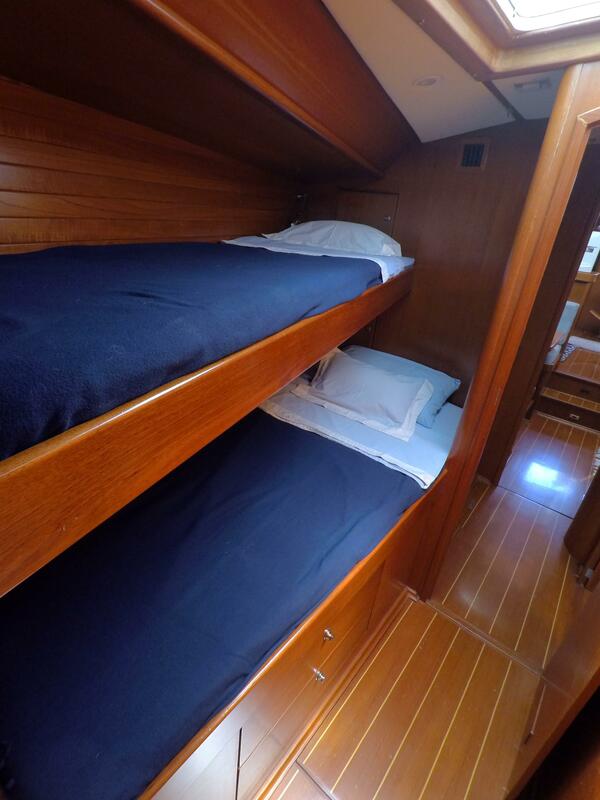 1) Spacious Owner's Suite at the stern, with centerline queen bed, and ensuite head with cherry cabins and countertop. 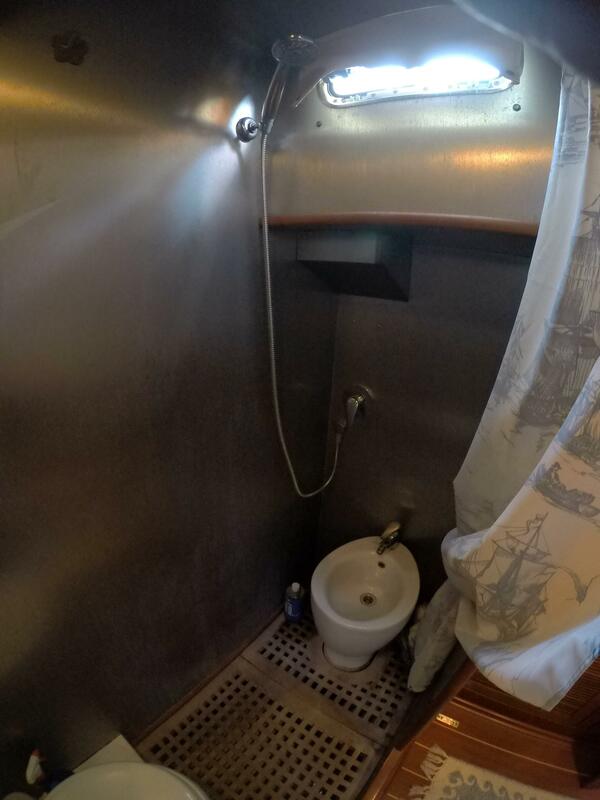 Separate shower lined with ss and toilet and bidet. 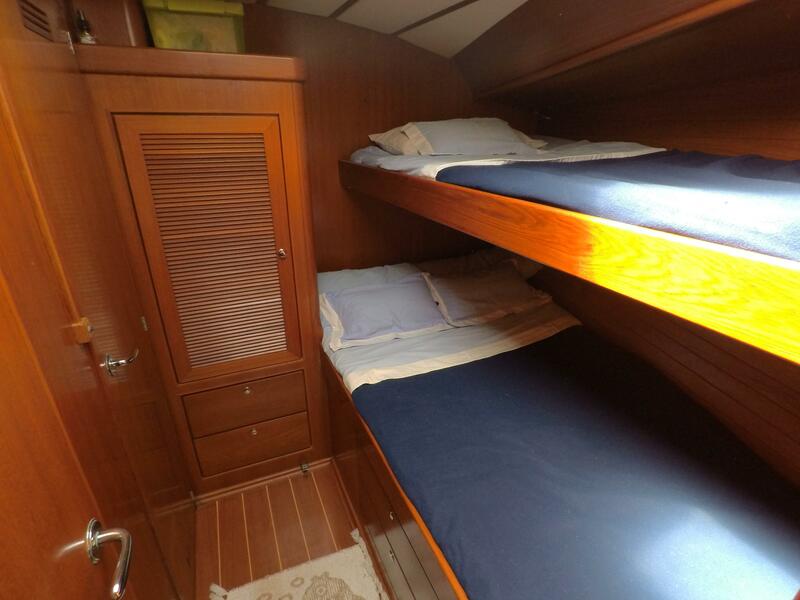 2) Port side, fwd of saloon has two bunk beds. 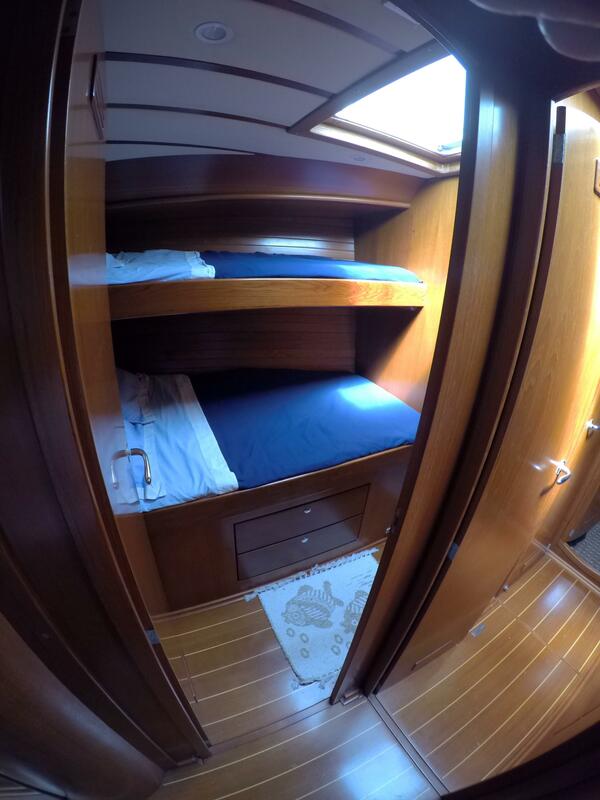 Bottom bed is more spacious. 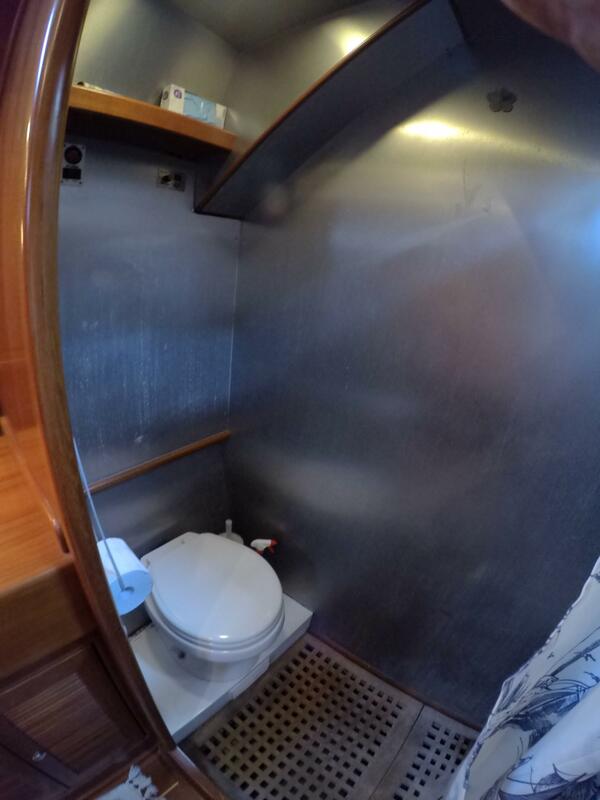 Ensuite head and shower that doubles as a day-head. 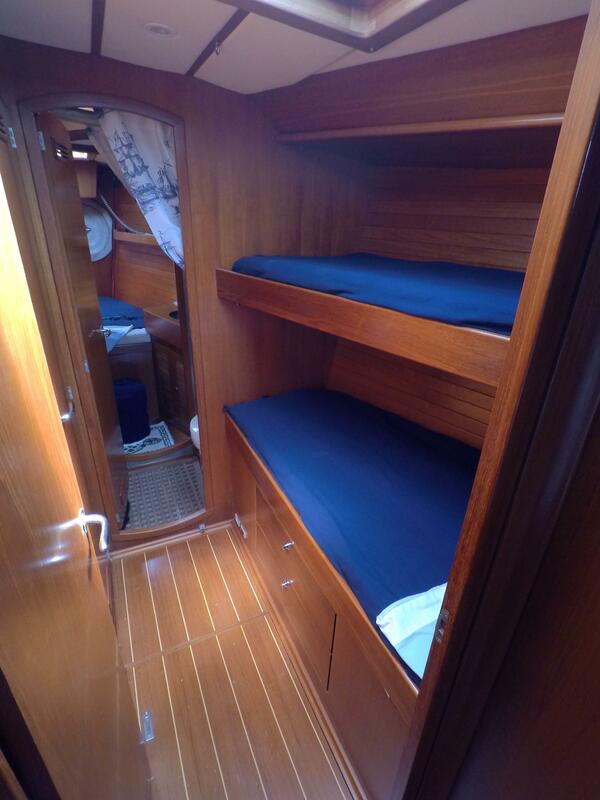 3) Starboard side, fwd of saloon has two bunk beds as well. 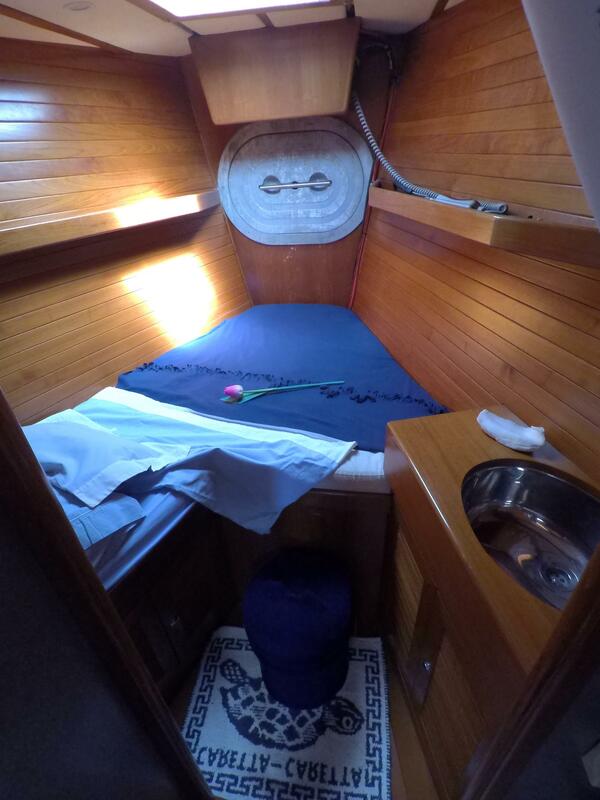 4) Crew cabin at the bow, with vanity, head, and shower. 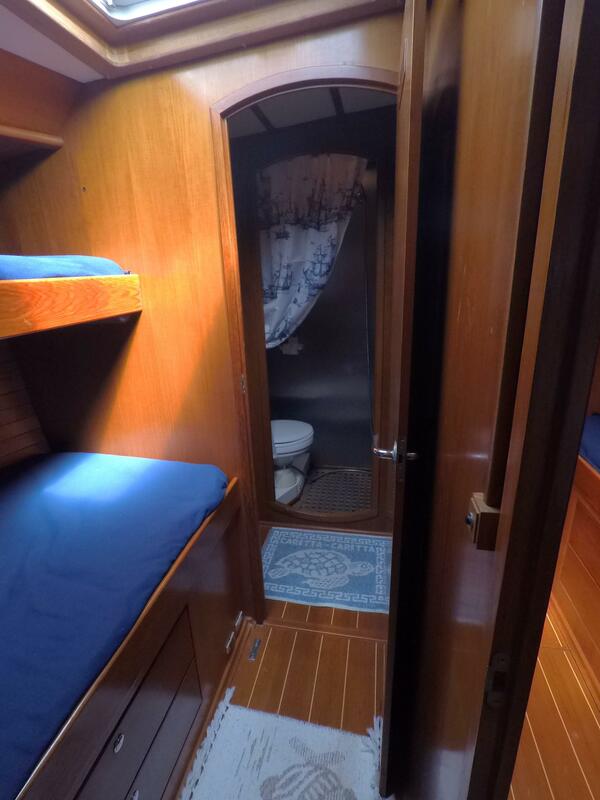 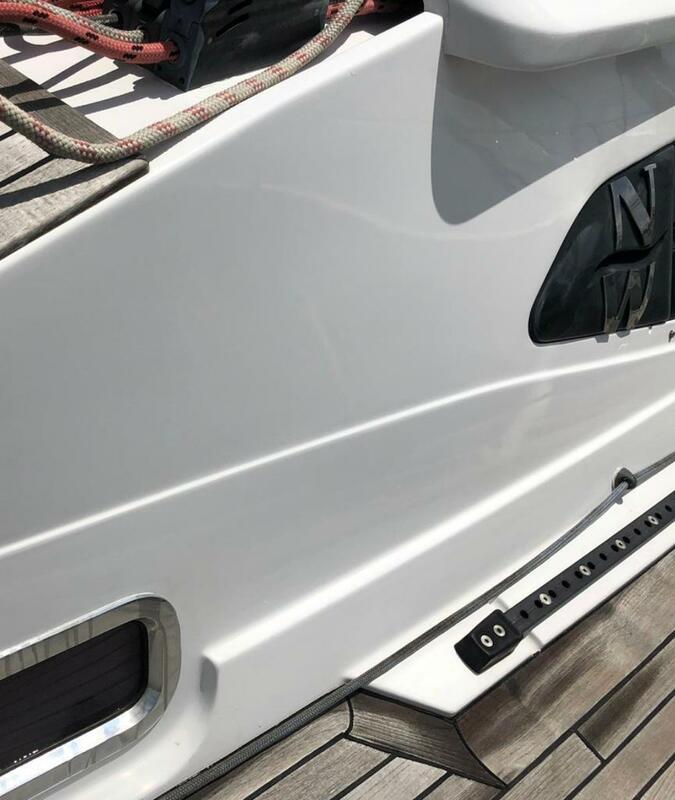 Access through companionway door and/or deck hatch.